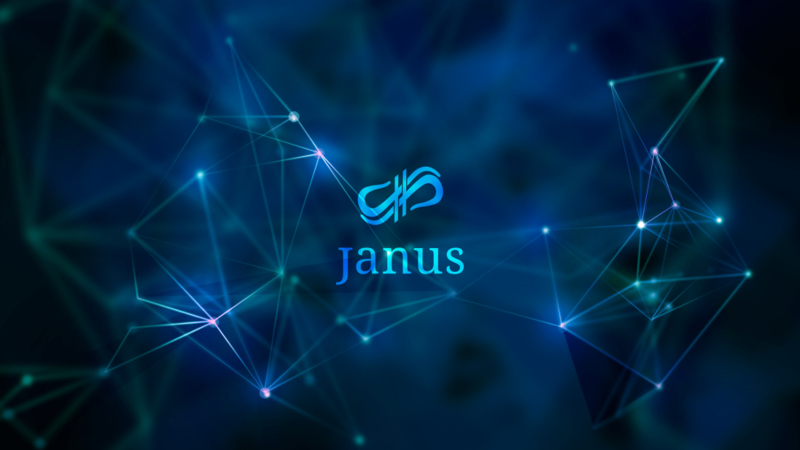 Hello everyone, within the team we have reached a decision on the final numbers for Janus tokens after this current and last distribution is sold out. This was something we have intended to occur and will set a fixed amount for those who participate in our project and avoid massive inflation of the profit sharing we have all come to enjoy. After the tokens from C-Cex exchange: https://c-cex.com/?p=jns-btc and the NXT AE: https://mynxt.info/asset/4348103880042995903 are sold. 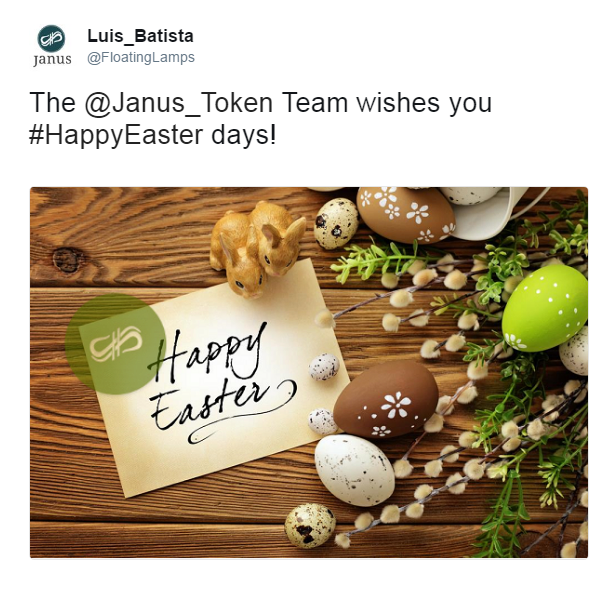 2.5 million for our teams holdings, 2.5 million for community efforts/bounties in the future and the like, 4 million will go to the final 2 JanusXT holders when they come to us. Thank you to everyone, from our team for the project support, we will do our utmost to continually deliver our work in a positive and meaningful manner for the years ahead. 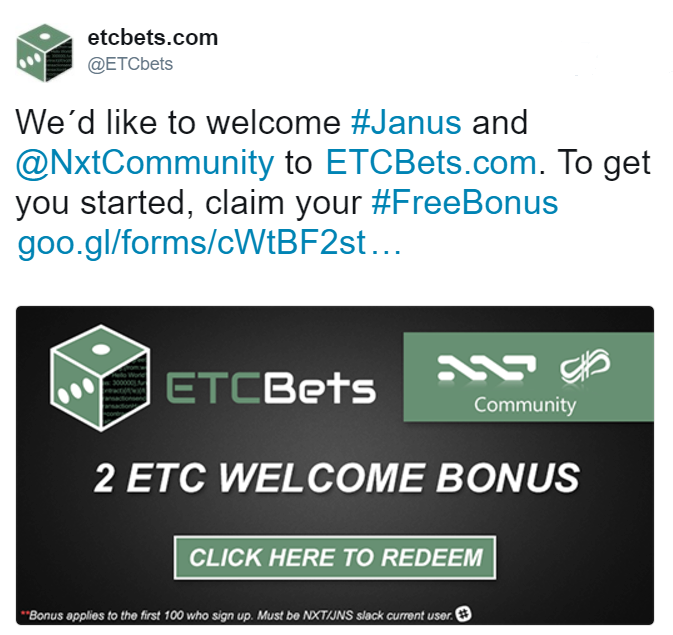 The community has voiced their desire to move the remaining Janus tokens from the NXT AE to C-CEX exchange to finish the distribution. 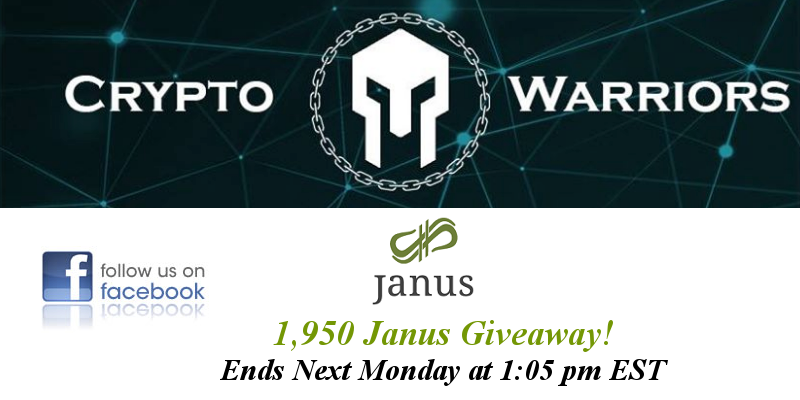 400k Janus tokens will be set at 3150 Satoshi each, this will finish the last distribution and commence the previous announce reduction shortly after sold. Thanks everyone for speaking openly so that we can take all of your opinions into consideration. 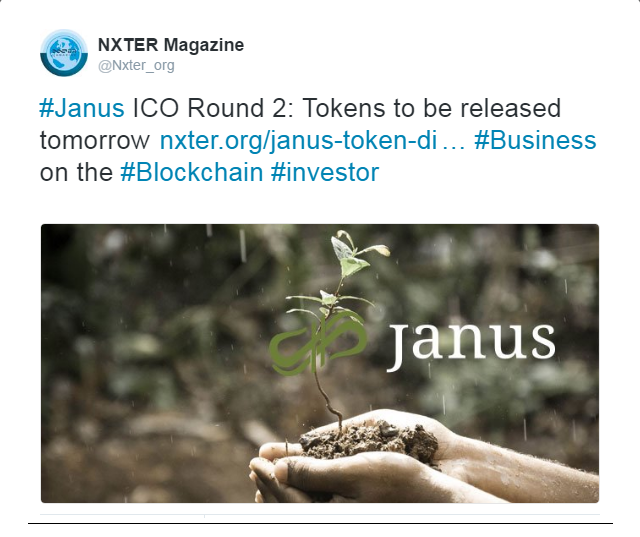 ---- Posting for transparency the deletion of Janus tokens ----. We have completed the final distribution for our team, this was a small but needed part of our project to help us offset internal marketing costs. With this sale ending it is time for our team to begin the process of supply reduction. 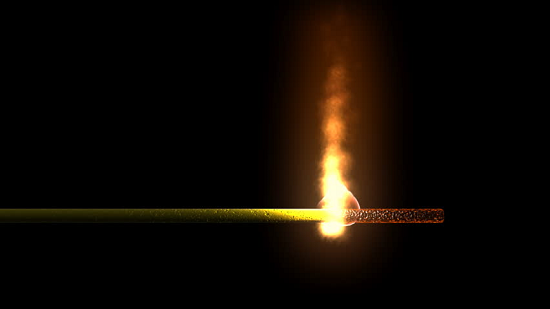 72,067,503 Janus tokens will be burned leaving in existence 25,201,489 JNS.Coinmarketcap.com will also reflect the new total in a very short time. It is also time to start delivering on the business sites we have outlined in our roadmap and side sites for supplemental revenue detailed publicly. We look forward to a bright and successful future both in Blockchain and mainstream business, our team is extremely excited to take you further on this journey and experience what our company and it's many branches will become. To reflect the large reduction of #Janus tokens we are also cleaning up the OP to make it simpler for those new to our project. Please bare with us as we complete the refining of it for clarity. 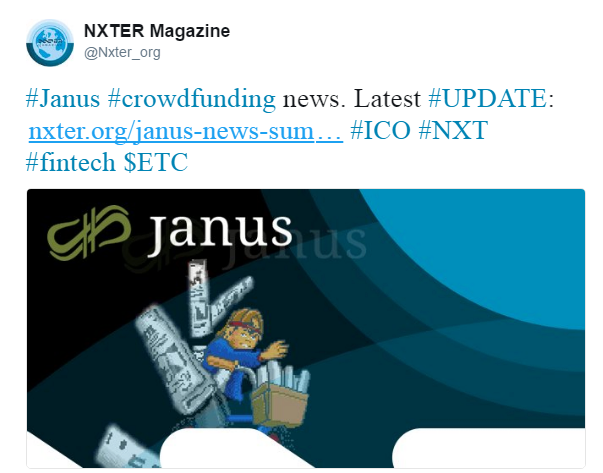 NXTer magazine has been providing the Janus project community and new users with in depth coverage of our work. Their team has been an observing presence in our slack recording nearly every detail and milestone since JNS launched in November 2016. This link also gives historical information on past profit sharing from January to current. 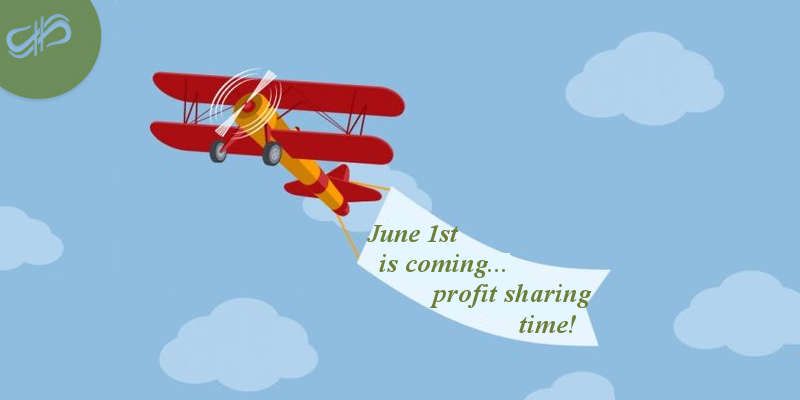 Passive income, especially in the Blockchain space, relieves some of the tension on users and can become very rewarding as our team grows and company forms this summer. Just a quick update the next 4-5 days our team will be testing the new site as we gear up for delivering it for the Ethereum classic community launch day. Keep in mind what we said in slack regarding the launch bonus for both you (JNS holders) and their community. 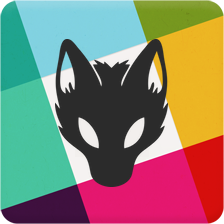 We will be verifying your slack names to the onsite accounts to try and cut down on what can sometimes become problematic with those who create multiple accounts on site. The site has a social aspect to it, I can't force you all to be friends but try to meet new people and make good connections. It may help bridge some things between our community and theirs. The past 2+ months I've had contact with ETC I found them to be a really good group of some solid men and women, I see it as opportunity. If this site is well received we will discuss with their 2 development teams some further work using smart contracts for our company in the months after we launch the mainstream site (social fintech/forex trading). Enjoy your weekend, more good news on the horizon. Hello, quick update for everyone regarding the new ETC business launch. We are very close to finishing, however developers need a bit more time to ensure Ethereum Classic wallet security is on par with our standards, as well as, testing multiple areas of the site and correcting issues we are finding. This could lead to a small delay for launch. We have several sites on the horizon, if we must push the launch back it will not be much longer than a week or two. It's still possible to deliver this business this month, however in preparation for an early May launch we wanted to be sure everyone was aware. Rest assured, our team is working 70-80+ hours per week to ensure a positive impact for the ETC community and Janus community on our project. Has the bolded part already been carried out? Hi LiQio, that´s correct. It was accomplished a few months ago. What should one do when the refund payment was not made? "Your refund has not been processed yet!" 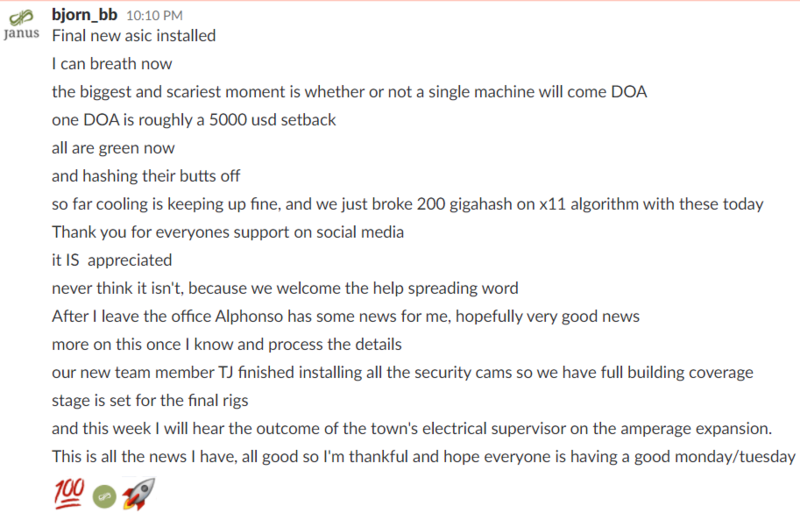 is the text I see on https://janustoken.com/tokensale/invest. LiQio after 45 days refunds ended, however please contact us at bjorn@janustoken.com and provide the txid and account name and we will look into it. 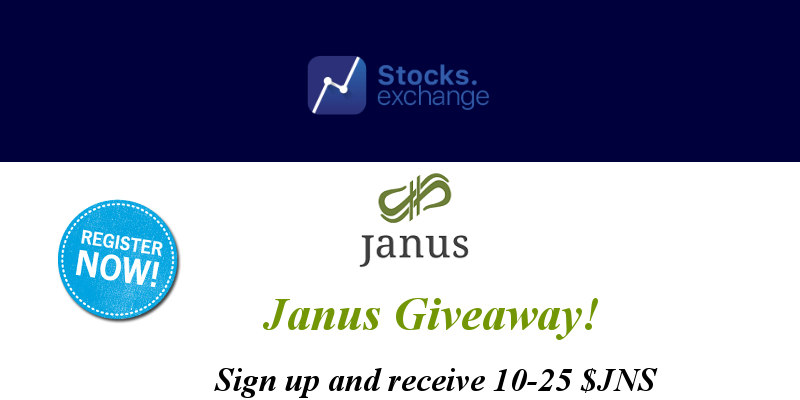 Janus monthly profit share will be sent today, between 10am-3pm EST. A total of 517095.84601752 NXT will be distributed among 374 accounts which own a total of 18,467,708.78634 shares. 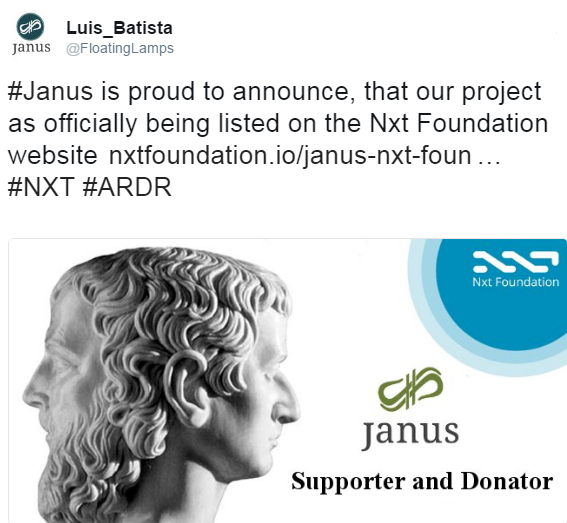 0.028 NXT per Janus owned. 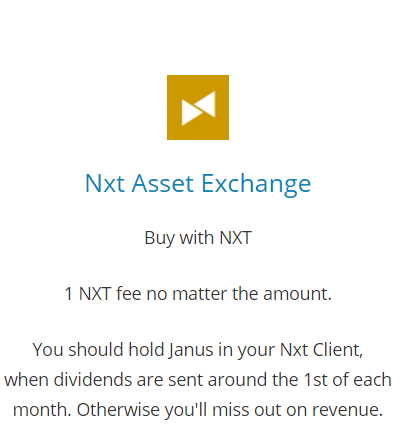 NOTE:If you are using Nxt client just click Account ledger, and you will get all transactions , including "Dividend Payment". 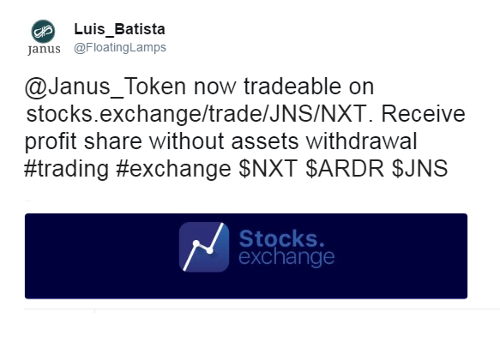 Users of stocks.exchange will receive dividends without withdrawing funds from the exchange. "It's very important to understand with our team, project, and future company goals we identify with strong platforms. With our team there will be no barriers, no platform segregation. 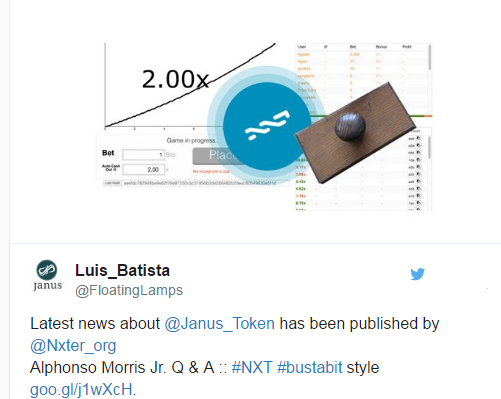 Our ultimate goal is success, whether Janus exists on NXT or a future platform, has zero bearing on our drive to see continued success in business. Nor will any token or Blockchain platform hinder the end goals. 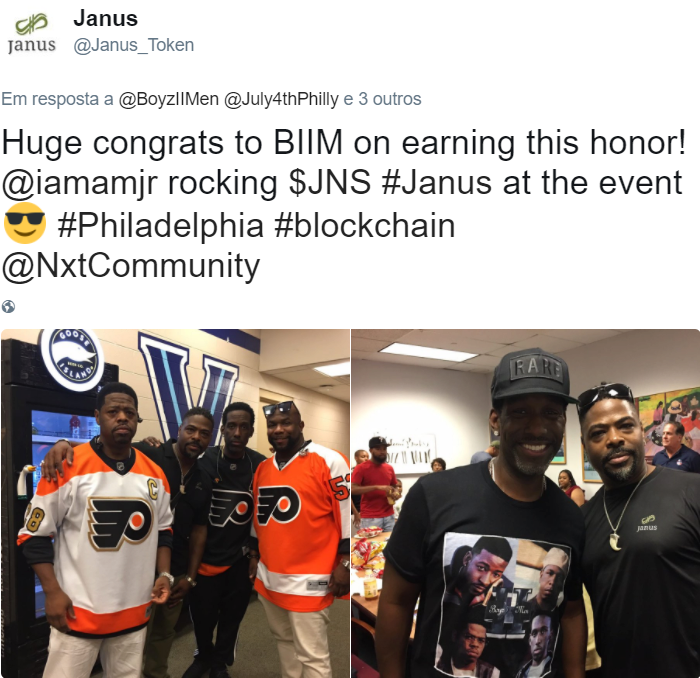 I'm very proud as a Janus team member to provide this site for the Ethereum Classic community. It comes at a turning point in our careers where we will be soon shifting into mainstream industry. While we cannot predict the future I can foresee huge potential in our concepts and direction. If you haven't researched our work, I invite you now to come take a look." We have confirmed a time with Nxt foundation member Marenkar to help us host the Q&A for our newest team member and company brand ambassador. It will occur, next Thursday May 18th starting 1pm - 2:30 pm eastern​ standard time. 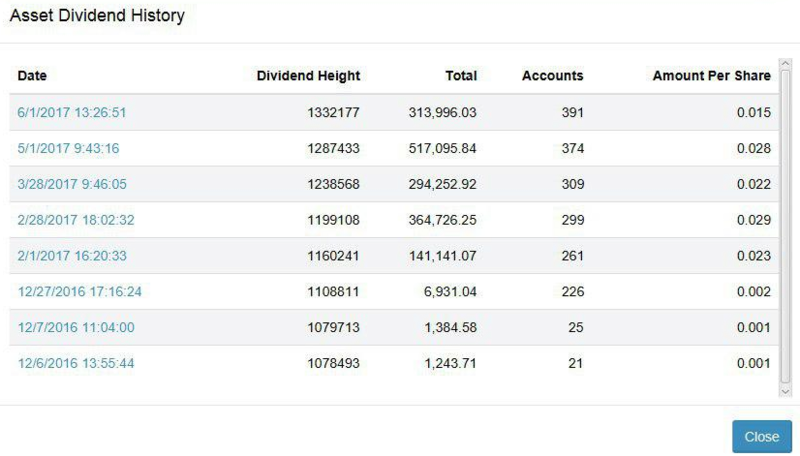 If you want dividends be sure to hold your $JNS in your personal wallets or Stocks.exchange. 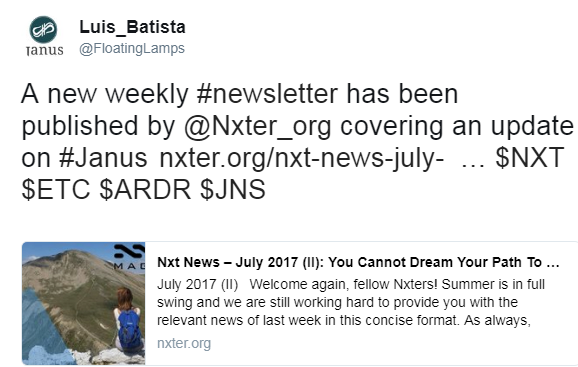 Some nice article share by a member of NXT community today. A total of 313996.0317951 NXT will be distributed among 391 accounts which own a total of 20,933,068.78634 shares. 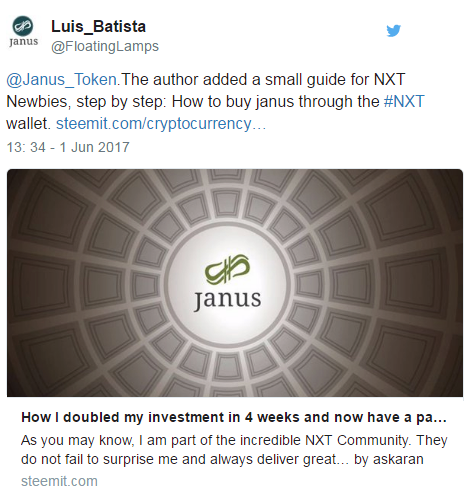 0.015 NXT per Janus owned. Users of stocks.exchange will receive dividends without the necessity of moving funds from the exchange. This monthly period from the current two sites that are profit sharing, we had a net revenue loss from players winning more than the sites profited. 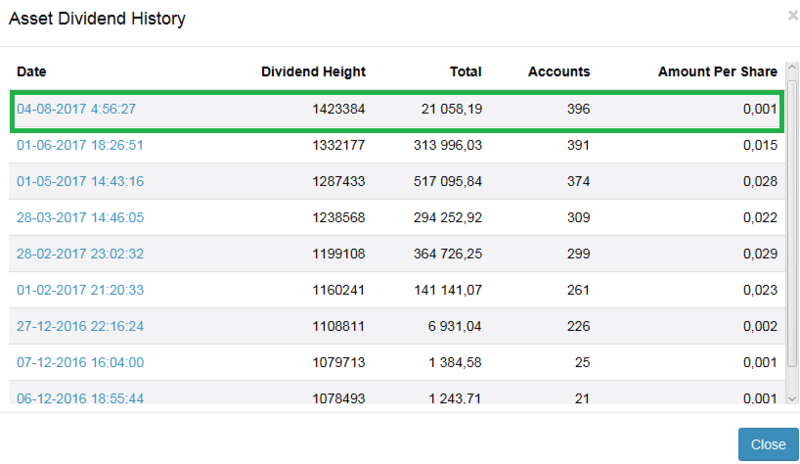 The divs monthly are provided when there is profit and canceled when there is an overall net loss. In the near future when business revenue stems from several industries things should progress more naturally financially as long as our sites see the success we hope as a team and company to achieve. If Janus community want to help to get JNS listed on others exchanges, just use the information below to try speed up the process of deploying . 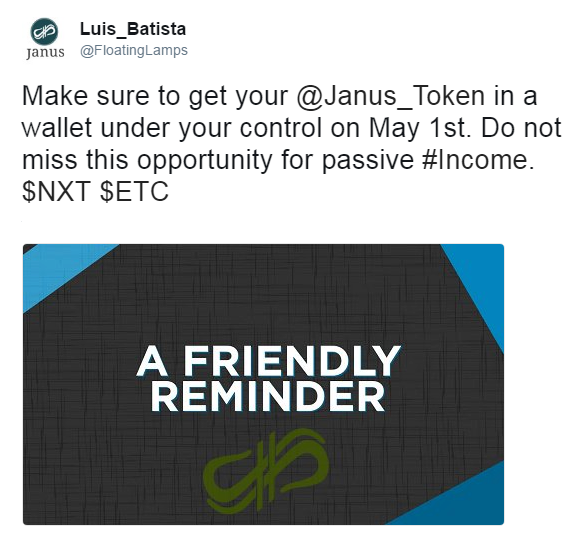 A simple tweet for any of your favourite exchanges, in the sense of listing Janus are welcome. 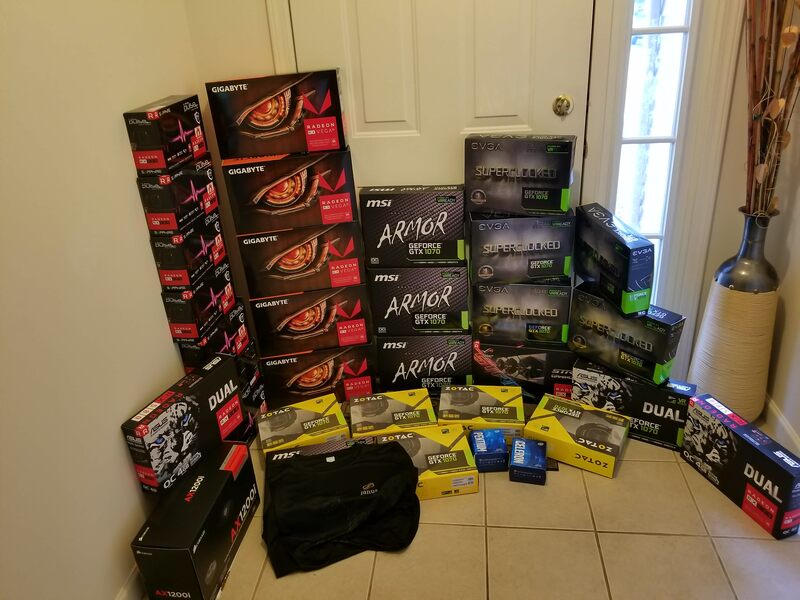 Shows support from the community. As you may have noticed, things have been a bit quiet lately. This post is an attempt to explain what has happened over the past few weeks and to clarify our outlook for the future. a) As you probably know, we got involved with the ETC (Ethereum Classic) community. 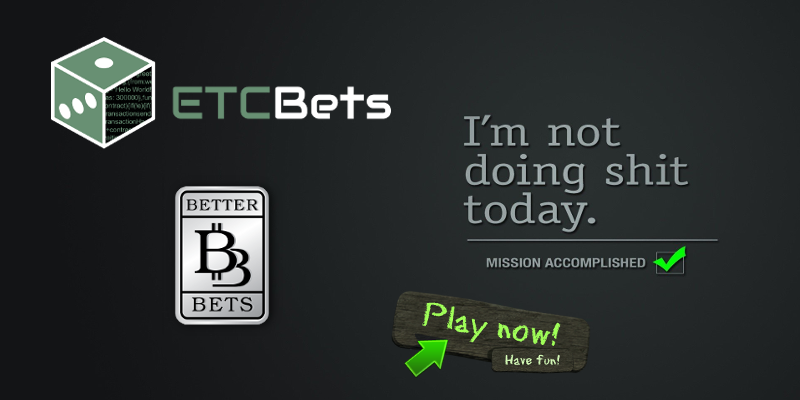 As an icebreaker and to prove that we're men of our word and know what we're doing (more on this later), we launched ETCBets.com , an upgrade of our existing codebase to use websockets as a transport layer which gives our site awesome betting speed and massively reduced server load. 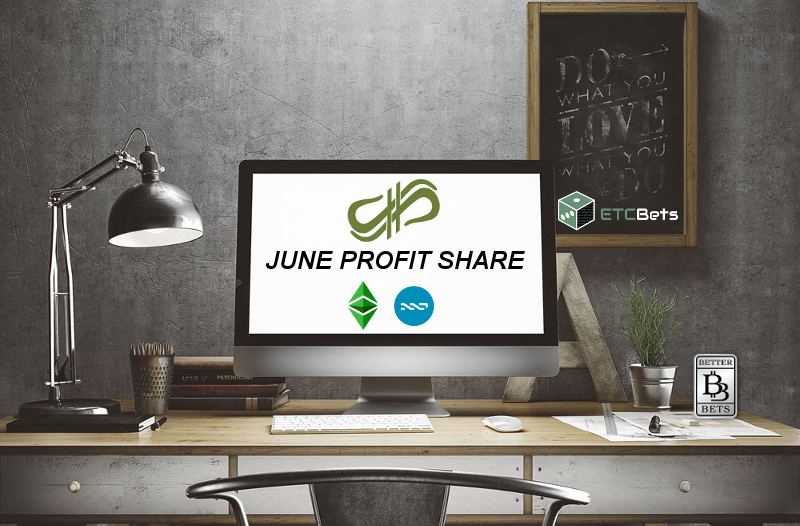 The site was well received and some of the site profits were distributed to both the ETC dev team(s) and Janus holders. 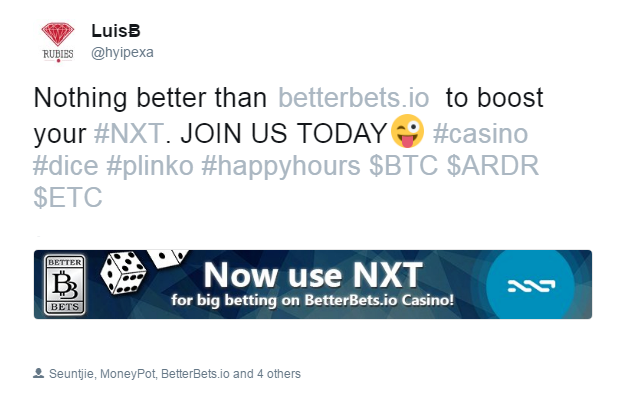 b) Parallel to this, BetterBets.io is still running and processing bets using both BTC and NXT. 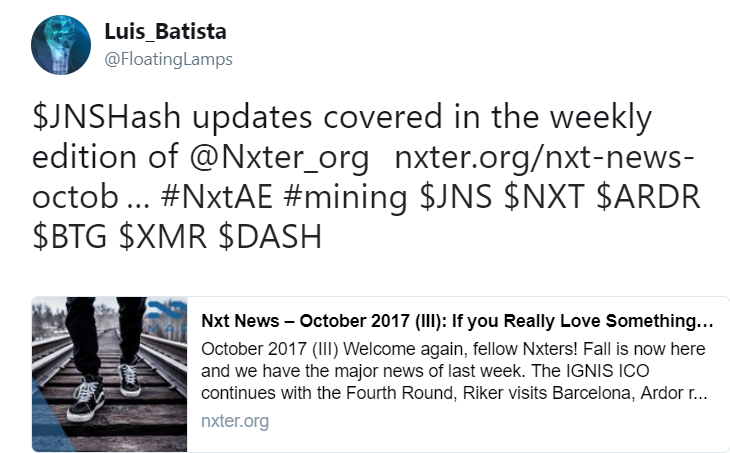 While it's initial reception from the NXT community was quite positive, traffic has dropped quite a bit over the past 2 months. 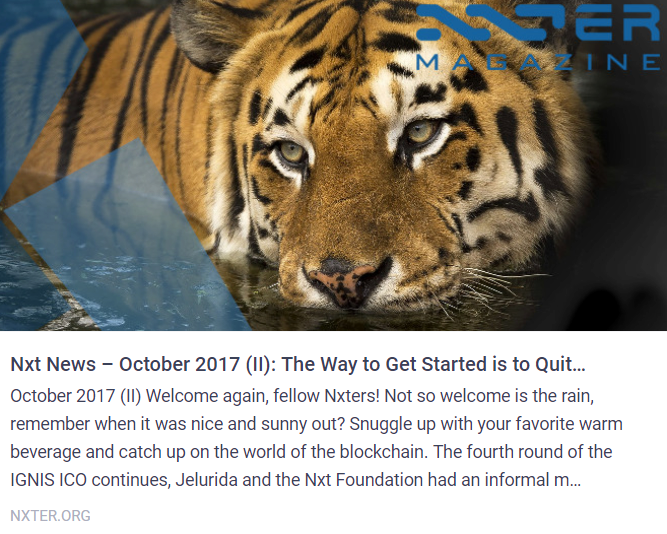 Part of this may be our fault because we've been focused on our future businesses and have not done a lot of promotions and marketing; another factor contributing to the drop in traffic may be that the NXT community is simply too small to sustain large betting volumes now that the initial site 'newness' has worn off. c) Since betting is an unpredictable business and lady luck can't be relied upon to always smile our way, ETCBets.com profits in May were basically wiped out by a lucky (and/or skillful) player who managed to win a large pot. 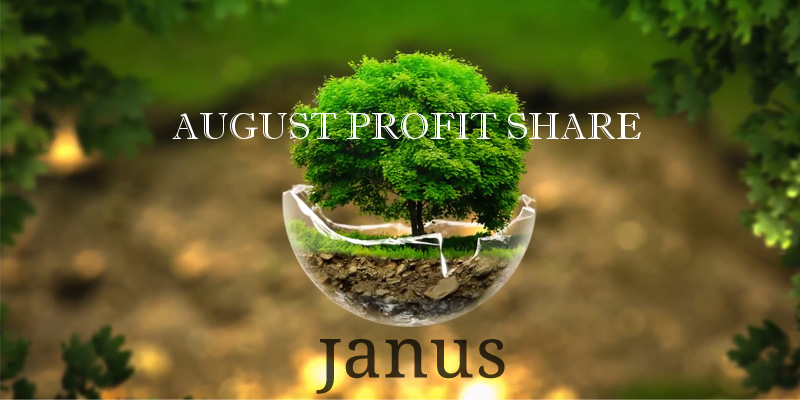 The same player came back in June and repeated his performance, leading to another low dividend month for Janus holders. Our feeling on this are (of course) mixed. On the one hand, we don't mind players winning and our investigation showed that this player's winning were legitimate; as such we can only congratulate him on his success (on a sidepoint, the fact that this player was able to win a significant amount of ETC should serve as proof that we run an honest and fair casino). 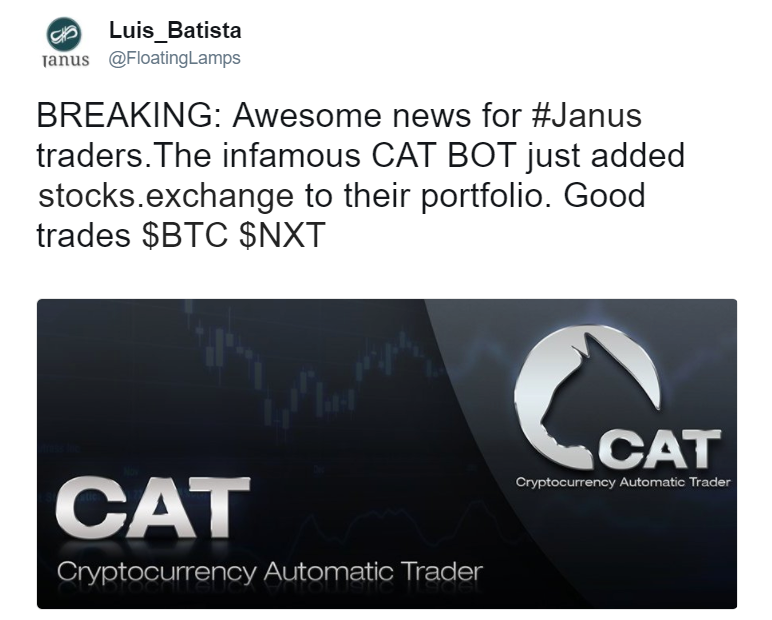 On the other hand, since we own the bankroll and could not distribute any significant dividends to Janus holders we're a bit saddened by our loss. But such is the gambling business, you win some and you loose some. d) Adding insult to injury, in early July a flaw in our site was discovered and an attacker managed to make off with about 490 ETC. 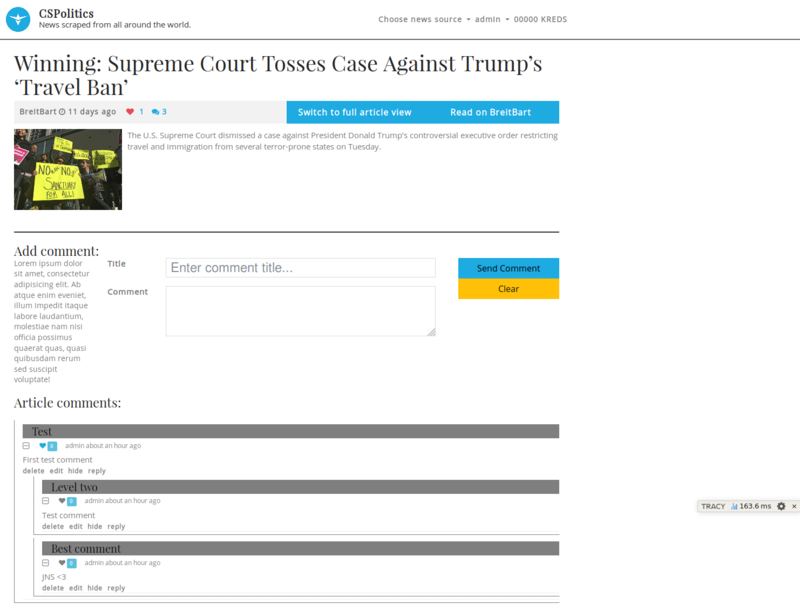 Due to the fact that we have certain safeguards in place the attacker could not extract more than his amount from our site, but the loss, while not crippling still hurts. We put the site into maintenance and have since re-engineered the code which was responsible for the exploit. As of 2 days ago the site is live again with dice bets; Parabolic will be put live during the course of this week. To be clear: our server was not compromised and the majority of our bankroll remains unharmed and in our possession. a) We have reached an agreement with a new developer who will join our team before the end of July. We hope that the addition of this developer will lighten the workload of our main dev (Lobos) and allow us to speed up development of our new sites. b) We have always said that we will not put all our eggs in one basket. As such, we have for some time had plans for some side initiatives which at least deserve a shot to see if they can grow into viable businesses. One of these initiatives is about 50% complete and it will be the task of our new dev to take the code we have so far and bring it to completion. c) In addition to everything else which has been going on, work on our first mainstream site - TradeMimic.com - has begun and some basic pieces of functionality are starting to come together. There is still lots of work to be done for this site and completing it will be our devs primary focus for the remainder of Q3. We will keep everybody posted on progress and hope to invite some of our Janus investors to be beta testers when the site/code is ready for that. Thanks so much for the status update bjorn! Has me pondering on as to what kind of flaw this "attacker" could have found that allowed him to take a certain amount of ETC, but that amount was chosen by you guys as a maximum. And how he knew what the maximum was or if he trial-and-errored it or what. Obviously for safety reasons I would never want you to delve any deeper about it; but one question -- this "attacker" who found the vulnerability in your site, and out of all the bad people on the Internet who do things like steal massive amounts of coins and whatnot; only one person found this. And the flaw has probably been there for a little bit. Did it probably take someone equally skilled in coding (or in something?) 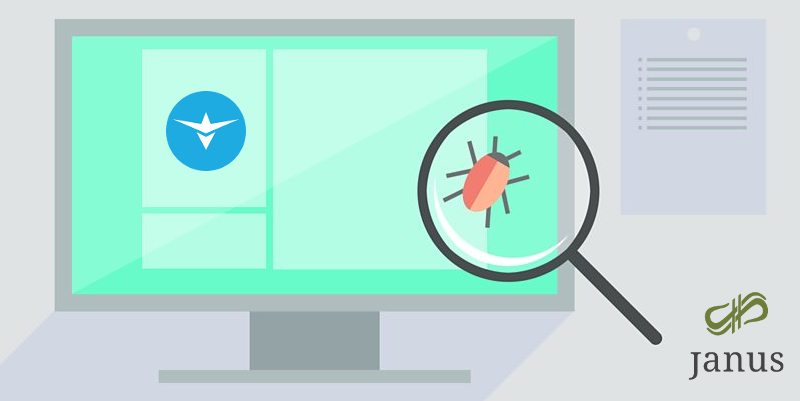 to find and exploit this flaw to those who wrote the code or, if you can answer this even vaguely, is there any chance the attacker was not looking specifically to steal coins and it was an experienced... person... who happened to find the flaw while simply using the website? With all of the (successful) phishing sites and attempts I have been seeing lately, and reports throughout the crypto community about coins being stolen and in MUCH larger numbers than this, looks like more people need safeguards! Occam's Razor tells me it was probably some individual with malicious intent from the beginning though. BUT, code can be exploited and passwords can be gained from insecure websites using nothing more than Google search. Just think if this flaw went unnoticed and unattacked for another year and maybe ETCBets became much larger in that year; and regardless ETC prices will be different in some way in a year. And maybe with further development that safeguard was (maybe significantly) raised, because my inexperienced complete guess tells me that limit was not solely put in place to protect against attacks on your site, but it is also some kind of maximum for the devs and coders over at ETCBets to prevent something like some sort of malicious attempt from within being able to destabilize the website and maybe Janus in general by completely depleting just ETCBets. I don't know, I find things like this very intriguing. Not the fact that you were attacked, but that you had a safeguard set in place that minimized it to where it was minimal damage in comparison to what I imagine it could have been had this safeguard not been in place. And even more intriguing if my inexperienced complete guess up there is wrong and the safeguard was solely for a would-be attacker/thief! Regardless, I congratulate the devs over there for the preemptive safeguards being in place! I could imagine the attackers excitement when he first gained whatever access he exploited, and how much that excitement went down when he realized he could not "take it all and run"
Awh, it's 50% complete and a new developer is stepping in soon to complete it, and you have no juicy (I'd even take vague!) early information on what this could be? Or what it could become? Or what it may bring about? Just how unique is this particular halfway-done side initiative? You might as well not even said anything at all! But I'm still happy ya did. More things to look forward to! 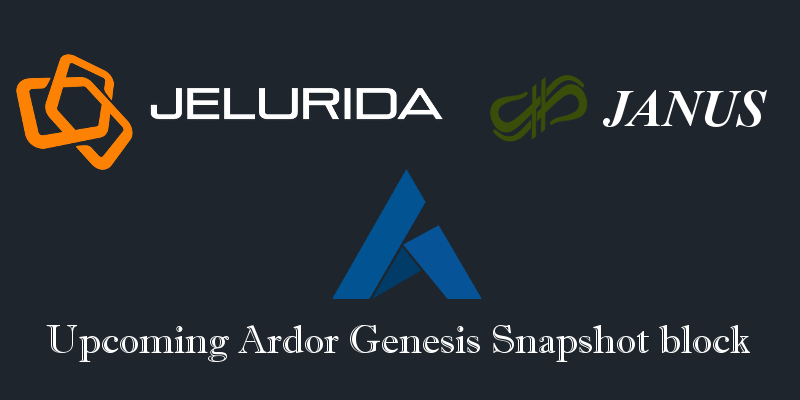 This is the final list of assets to be frozen at the Ardor Genesis Snapshot block. Trading and transferring of those assets will be disabled, and existing ask/bid orders canceled automatically at that time. 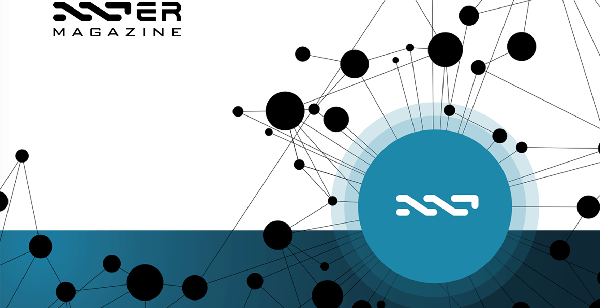 From the snapshot until Ardor launch, there will be no way to trade those on the Nxt blockchain. More details regarding external exchanges will be released in due course. 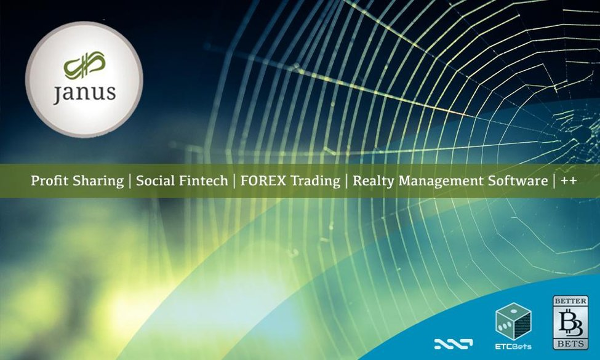 A total of 21 058,19 NXT will be distributed among 396 accounts which own a total of 21,058,198 shares. 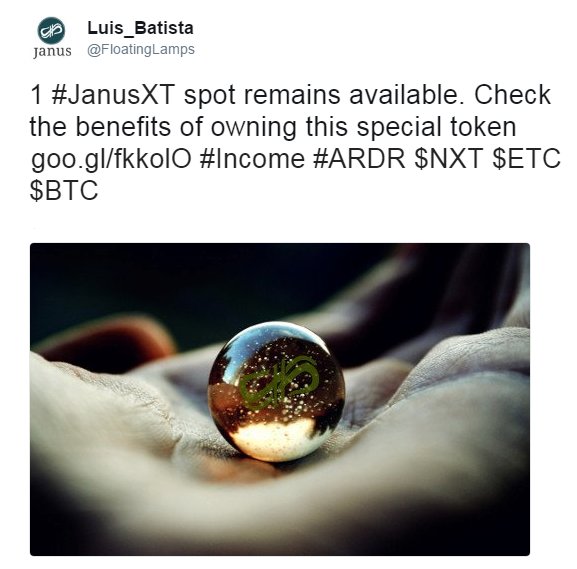 0.001 NXT per Janus owned. Our hope, is that things should progress more naturally financially, as the fruits of the businesses under construction hit the market. Janus, might not be the right target group for short-term gains, but for long-term brand building it plays a huge part (we want to see combinations of business sale revenue and operations revenue). "He who does not value the small, is not worthy of the big" . Support teams within the platform join #janusproject if you have questions and more updates will be following soon. As the mining farm portion of our business grows we will look into adding the addition of hashpower based on a per token basis. This time period is essentially an early adoption period, and our goal is to find new ways to add market driven token value. 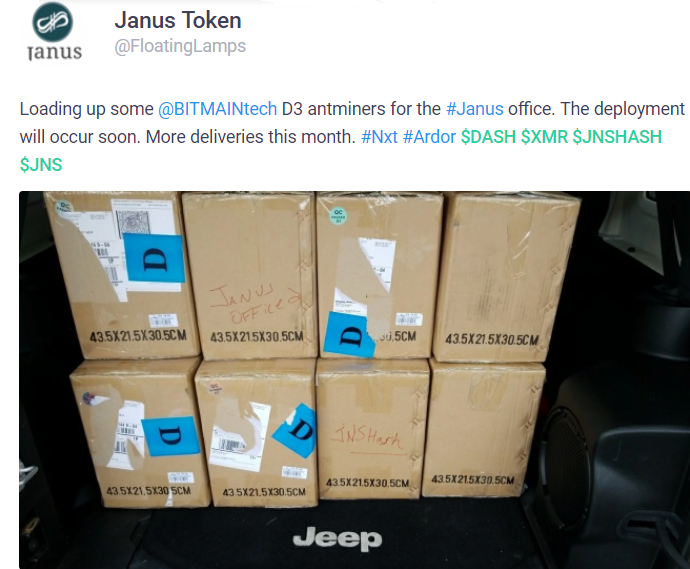 It is not outside the realm of possibility to create an exchange similar to what Bitmain does with Hashnest to push per JNS value to levels more acceptable for mainstream investors. Remember, when the Ardor platform launches, all your tokens will be migrated to it on launch. 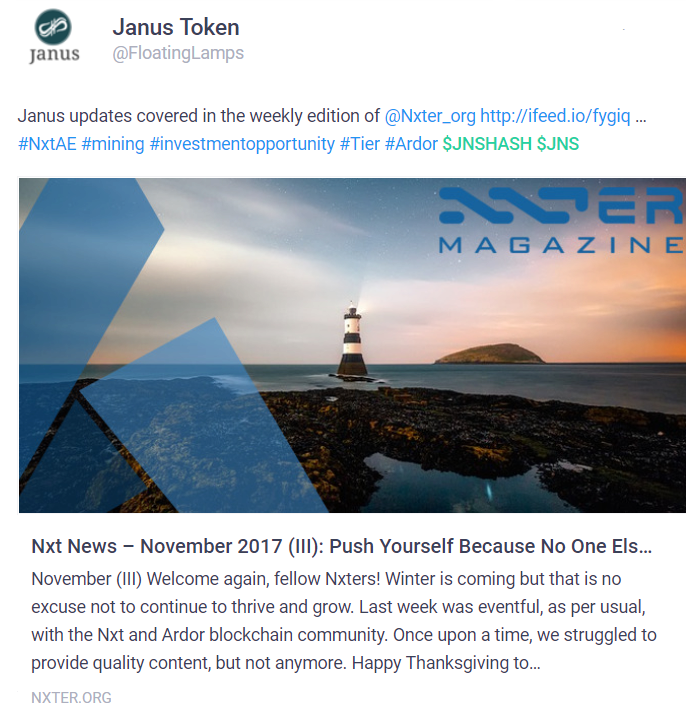 This means all holders can capitalize on this opportunity, it also means during the Ardor launch, that Janus tokens on NXT will be temporarily frozen during the snapshot. If you want to take advantage of this make your purchases accordingly. 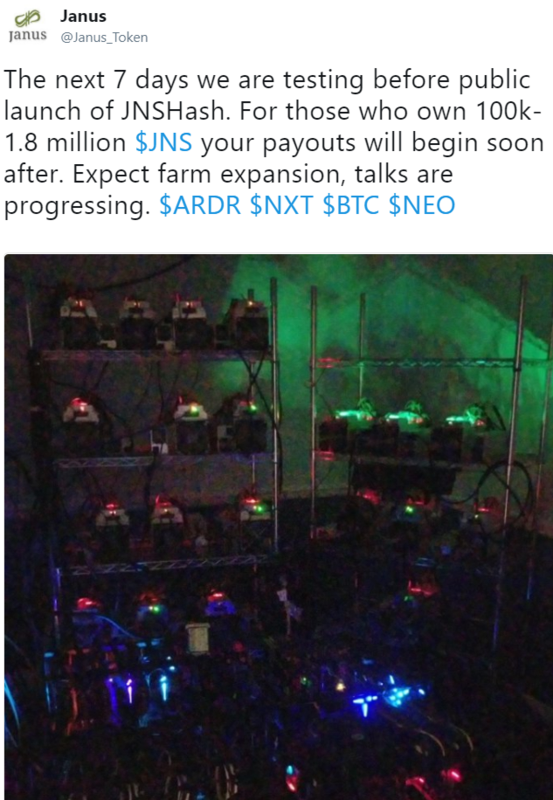 We have placed 2 sell walls to help with building the mining operation JNSHash on both the NXT AE (at 1.99 NXT per) and on C-Cex https://c-cex.com/index.html?p=jns-btc at 1799 Satoshi each. Ardor is positioning itself in a very good light for the future and business/technological use. Especially with all the cracks being found in other platforms (Ethereum, for example), it's not absurd by any means to foresee a migration to Ardor after a successful launch and code observation. 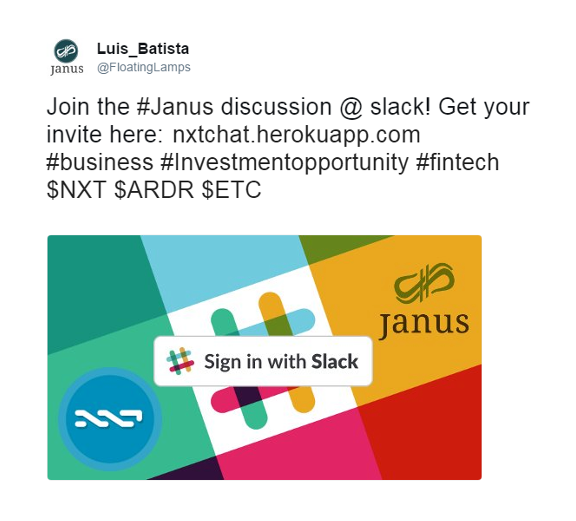 Come join our slack if you have further questions, we have over 3000 people in Janus slack. 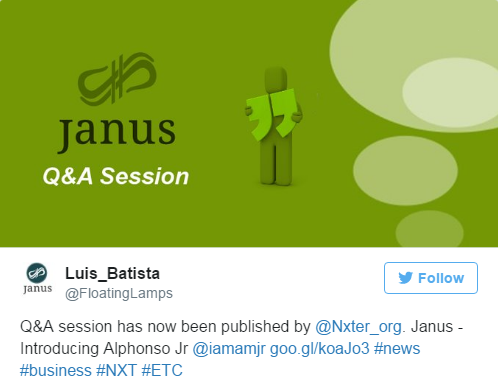 Janus (JNS) is almost one year old, congratulations everyone who have taken part, and welcome to all our new users! One of our upcoming sites is very important to the growth of our teams' online presence. It's not been mentioned much on this forum (mostly in slack), but is related to mass media and also has some tokenized reward aspects we are incorporating into it. 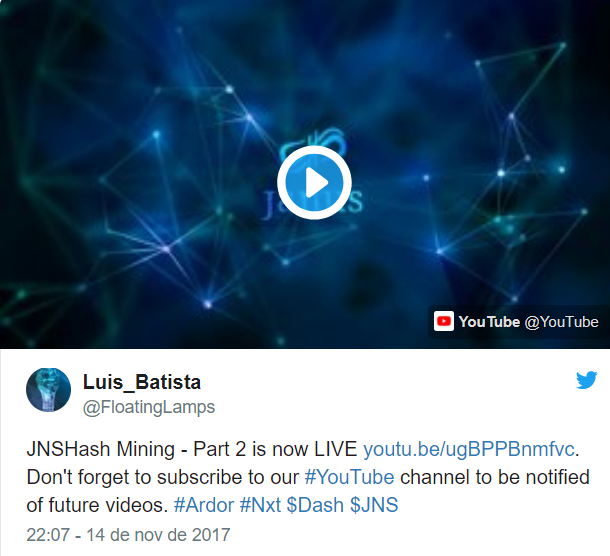 This will open many new doors for us and in turn options for JNS users plus more coins. I personally, did not initially plan to have so many large announcements all come at the same time, but this is what happens when a team is split into varied industry sections. It just so happens the launch of JNSHash will be around the same time as the aforementioned scraper site; www.trademimic.com will not be far behind as well. 2018 will be a year things take a very productive, and action driven course. 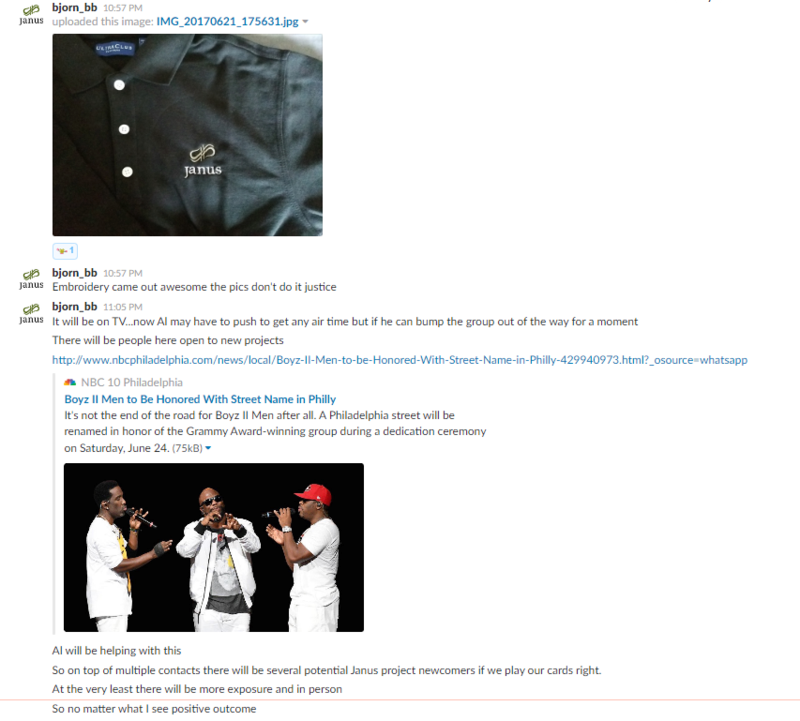 New update #2 showing current JNSHash mining operation progression (in case you missed it). The third and final video will put this side business at 200 amps, depending on the success in this business and market activity we will expand mining and if financially feasible, allow all token owners access to hashpower. Watch also video 1-2 to see the jump in progress (there are no team prompted ads these videos are strictly for coin users). 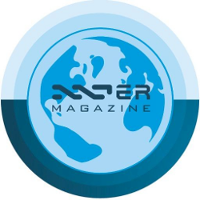 We are finishing up the JNSHash membership document and our development team is undergoing testing for the media scraper site we have mentioned. The whole team will be reviewing the new business site before launching. Target date and links to this site for launch will be revealed after stress testing and all people can review. It may not be fully known yet but this media site opens up so many options even if its only a mild success, it opens up so much more if it becomes a large success. Either way, we have great plans to merge blockchain into this site, and potentially many more like it. 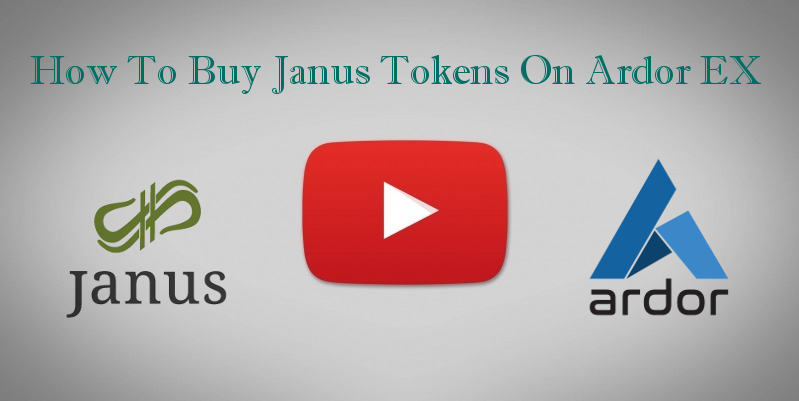 As a Janus token holder everything we will give each person some access to each project or site. It may be as simple as a discount on a marketplace or bonus coins from our mining farm. We cannot peg this currency to simply one thing, our team prefers diversity, and diversity is what you get for owning it. Expect the JNSHash details and announcement within 7 days, most likely December 3rd. 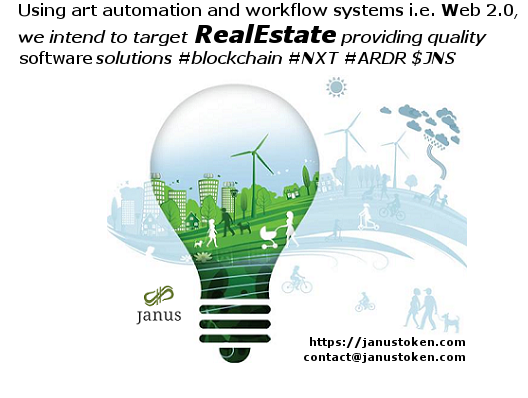 *Based on your current Janus (JNS) address holding, excluding external exchanges addresses. ** Hashpower proportionally distributed by each tier holder. *** Assuming a total income of 125 USD total daily and proportionally distributed per tier holder. The tier membership plan benefits will be valid for one year, and once finished it can be renewed. Renewal procedure will be announced 90 days prior to first-year membership end. 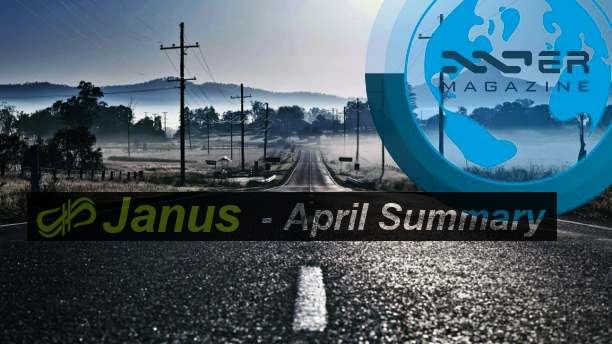 In the event that the membership is not renewed, members hash power will forfeit back to the Janus Team. JNSHash qualifying members will be prompted to choose their favorite currency/coin to be mined from the list shown on Prohashing.com. Our team strongly advise to pick up a wallet with private keys, not an external exchange wallet address. Payouts will be sent from daily to weekly depending on coin chosen and when Prohashing.com threshold is reached. Daily membership are more static, however, in some, circumstances bonus coins from new coin launches (potential projects launch that show promise), will be sent to each member of each tier as we have demonstrated the past couple months. When this occurs we will announce and collect appropriate wallet addresses for the bonus coins. 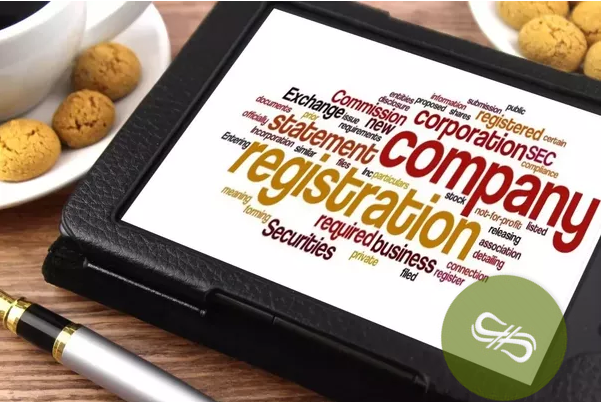 Participants may move JNS from their signed account as long as such action does not jeopardize their Tier range. If this happens, they will be removed from the plan, and won't receive their payouts. One switch coin per month. Subject to change in frequency as staffing time allows. In the event that any participant wishes to upgrade/downgrade their Tier, our team strongly advises to contact us first. Each participant may have more than one signed address per tier. 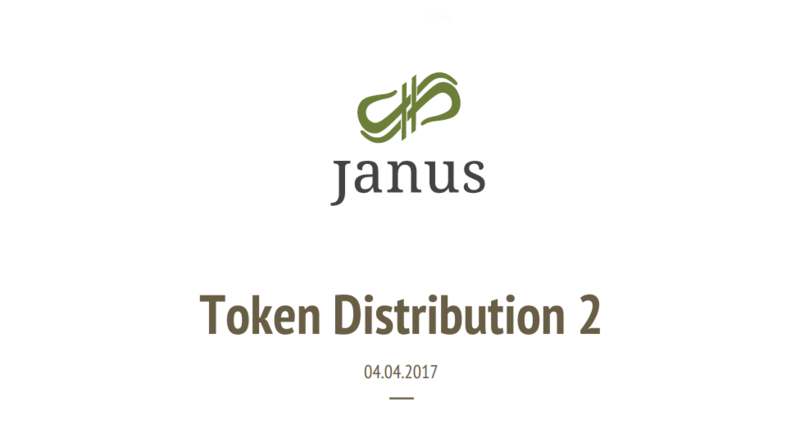 Example: If you have 1 million JNS tokens (framed in tier 3) and find that you can not reach tier 4, you can technically split the tokens into two different wallets. 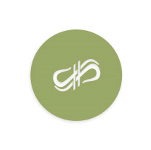 Use this sign-up form https://goo.gl/forms/jSHrqBWXTkQ2Drrg1 to participate in the JNSHash membership plan, otherwise, we won't be able to review your information and follow your records. This is a beta test for the cloud mining. Membership benefits and mining hash power is subject to change and fluctuate based on business needs. Hashpower per tier could grow or shrink if our team deems a new coin launch could be more profitable for our team and our members to mine speculative. 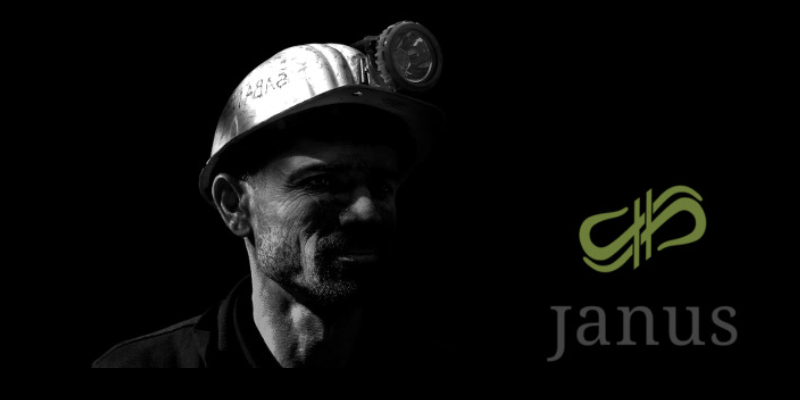 If the value of Janus tokens grow and market liquidity increases to a point where the team can periodically sell for income, the Janus team will set aside 20% of this income to increase hash power through equipment purchases to fuel the mining output. Prohashing.com is not owned by the Janus team and has in the past like any pool the capacity to go offline temporary or permanently. In the event of a total closure of this pool, our team will adapt to make accommodations for a new pool and resume membership bonuses. 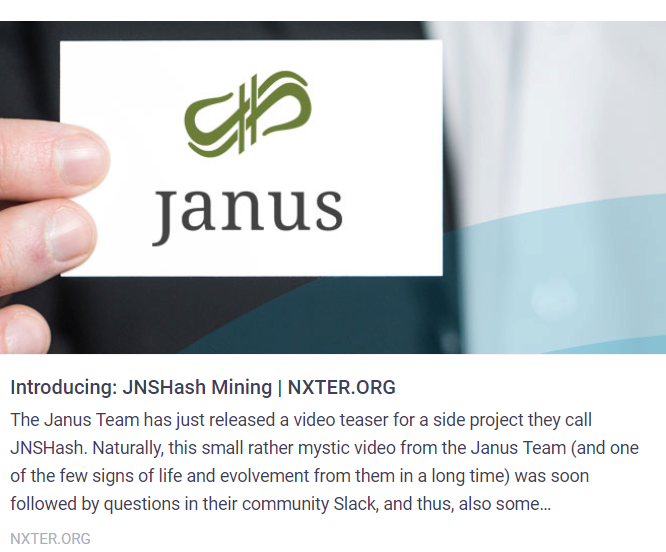 The Janus team will do everything in their power to resume mining at the highest paying pools and adapt to industry changes to maximize JNSHash member bonuses. 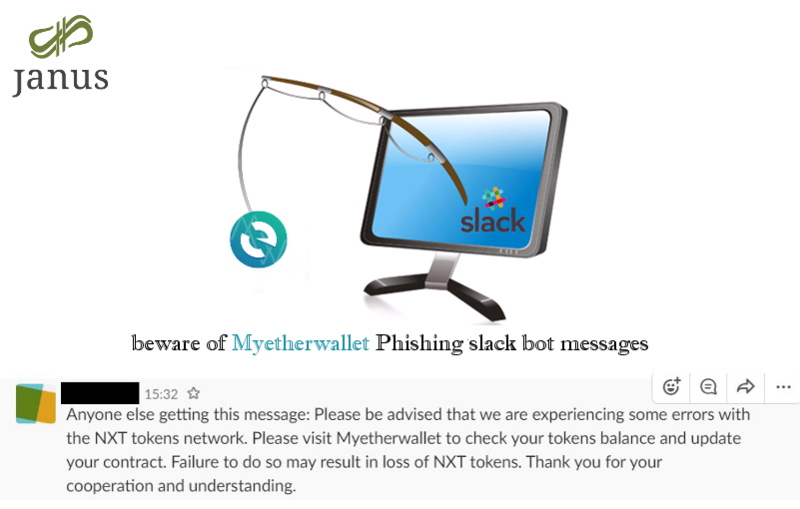 All members will be notified via slack, forums, or Ardor wallet messaging service, in the event of any pool outages or changes to mining output. 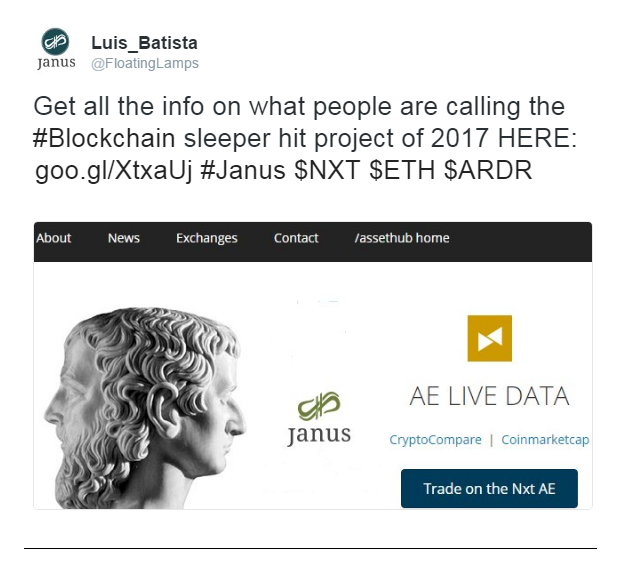 Janus tokens will be on the new Ardor platform the moment it goes live. 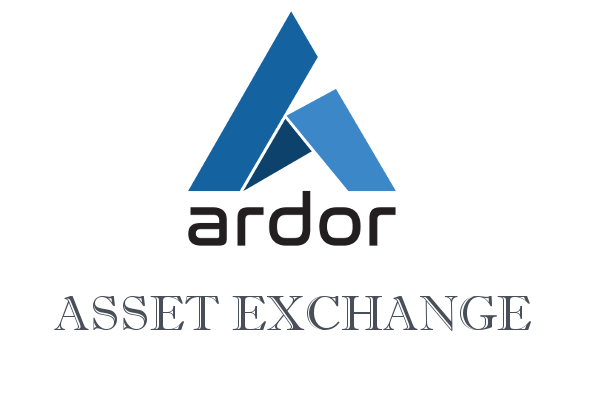 All user tokens purchased or owned before that time will exist on Ardor after launching. If anyone has any questions, do not hesitate to ask. One of our community members have noted Prohashing.com had closed registrations. Our team will compile a list of their payout options for our farm and put them on the google doc form for easy selection. we have run into an issue with the current building for our electrical needs and the cost to revamp the transformer exceeds the cost to just relocate the farm by many thousands in funds. We apologize but the next 2 weeks we will need a lobetter-suited suited office to get hashing again. We have considered already and contacted several options and places. Giga-watt in Washington state, another hosting facility in Iowa state, as well as reaching out to local commercial building with 3 phase electric owners. Today we have a strong potential option for a new location (it becomes available January 1st), Bjorn is moving as quickly as he can to make the shift and deals. Even though this adds time delays, it's because much of the world moves at a pace that we, in Blockchain, do not, IE: people are slower. To avoid a service interruption in the future, we will not lease after this first year, but will, in fact, build our own facilities for mining. The land for this has been secured ahead of time, so this is part of the good news. Once we have our temporary location up and running then full plans for our own place, on our own property will be revealed. That the new year's wishes become opportunities for growth and achievement. 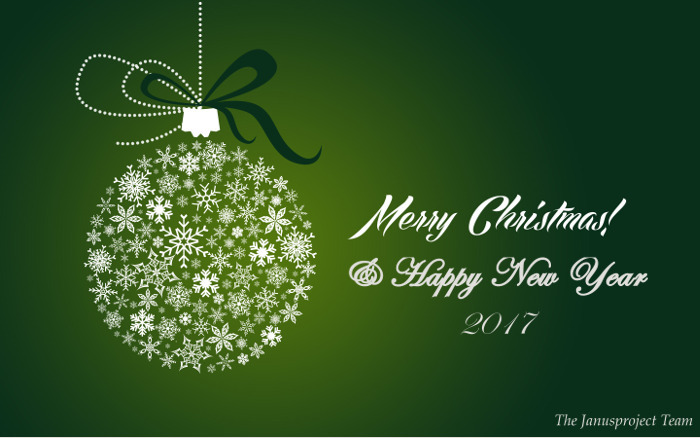 We hope that the new year will be synonymous of success for all. 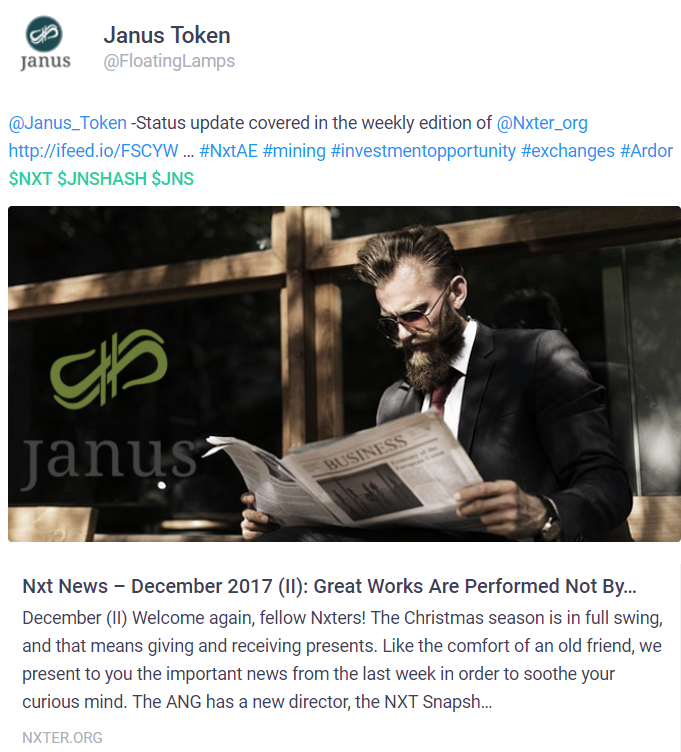 Nxt snapshot block 1636363 fulfilled. 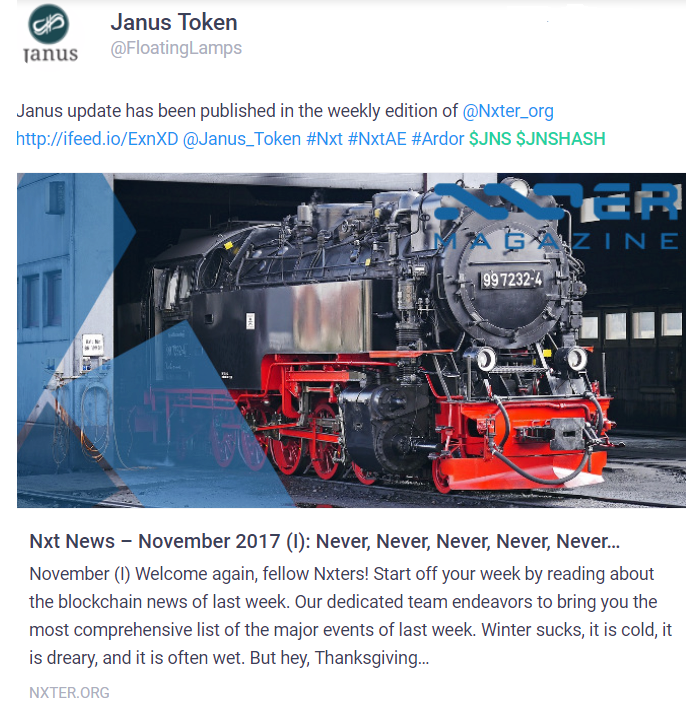 $JNS asset tokens cannot be traded again until Jan 1st when Ardor launch. Be careful of possible scammers selling fake assets with the same name! Basically, our team is going in and out of new potential mining buildings to secure a spot we have plenty of room for growth. When we first started the mining farm I could not anticipate the rate of growth we have achieved and we very quickly outgrew our first building. I personally apologize for this delay and have established several building inspections the past 7 days and next 2 weeks until the new one is found. Fingers crossed, tomorrows visit results in the right locale. We have already secured more equipment to expand the income possibility of this membership for JNSHash while building hunting. Ardor 2.0.9 is released! This is the first production release of the Ardor Blockchain Platform! 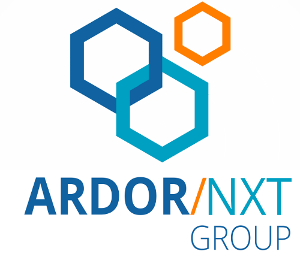 The Ardor Genesis Snapshot has been taken at Nxt blockchain height of 1636363. The Genesis timestamp is set to 00:00:00 UTC, Jan 1st 2018. Everyone with ARDR balance >= 1000 is invited to setup a node and start forging. Block generation will start automatically when the Genesis timestamp is reached. In the meantime, please check your balances and report any discrepancies from what you expected. The first start after installation may take a few minutes, do not interrupt! You can check all your Ardor balances, connect using your NXT account, switch between the chains and check your official ARDR, IGNIS and BITSWIFT balances as well as Janus Assets. If you want to gain access to your NXT, just download the wallet from https://www.jelurida.com/ (Nxt downloads) or from https://bitbucket.org/Jelurida/nxt/downloads/ and you can log in with your NXT account. Let us take a moment to examine ourselves and prepare a resolution on how we can be better this year. 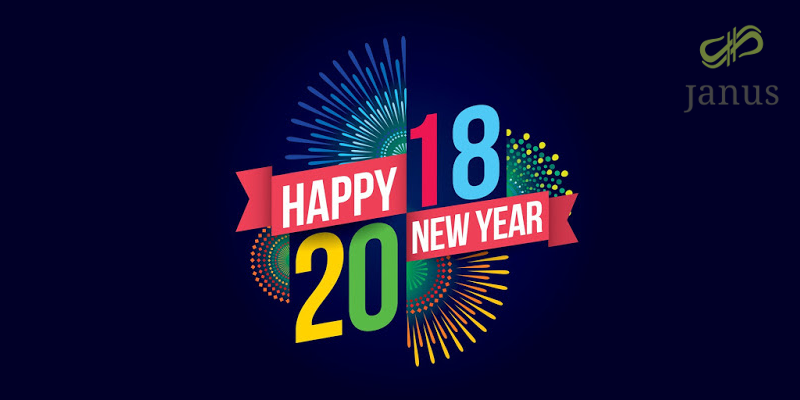 Wishing you all a happy and successful New Year! 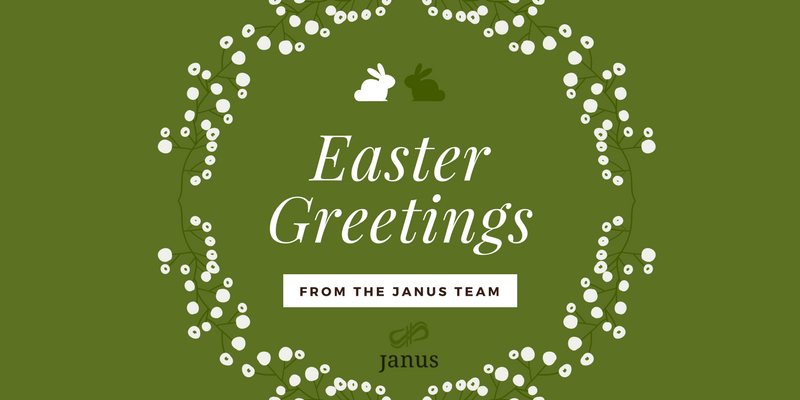 All best from Janus Project Team! Ardor v2.0.10 is released! This is a bugfix release, mandatory update for everybody! Android mobile client is also available now! Help retweet if you get a moment. We are coordinating 2 major releases right now and following it up with 4 major releases for the next 2 quarters while working on new exchanges. One is physical, the mining farm, one is our media business site(s). We will have some news coming I believe those new and old will enjoy soon enough. The cost to roll out the farm with several times more amperage is something I am tackling now, to understand how serious I am about it's growth I have asked my relatives to step in with me and help move it faster. Why is this important? Well because when time is an issue I will resort to the most trusted people I have nearby, my own family to speed up the building. Several members close to me have skill sets to turn any structure into mining at scale in short order. Ardor v2.0.11 is released! If you are still on a fork, upgrading to this version will automatically fix it. 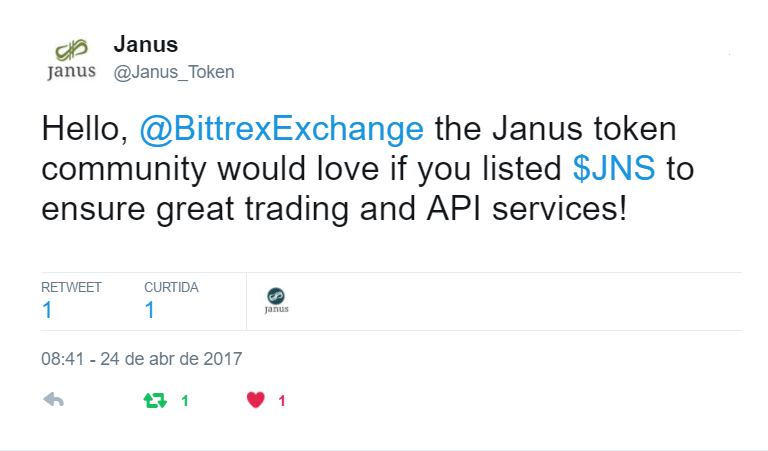 Janus is looking into being listed on the AEX exchange. Since they already have support for Ardor and Ignis, it should not be difficult for them to add Janus. 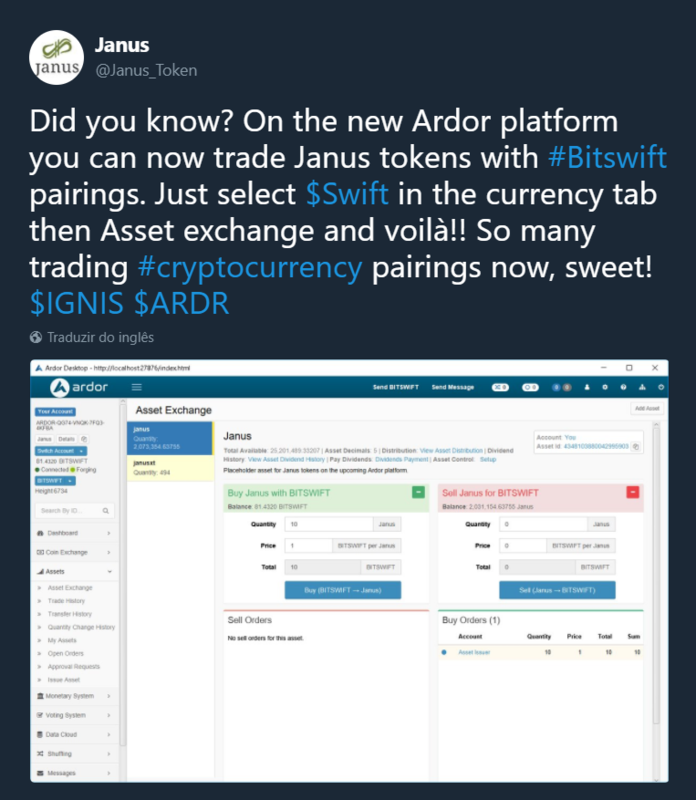 You can buy and sell Janus using IGNIS and the BITSWIFT child chain currency on Ardor’s decentralized token exchange. 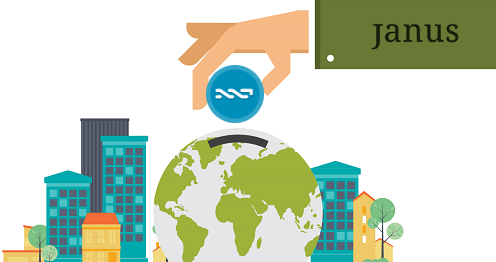 You will also be able to buy and sell Janus and any other asset token(Nxt and Ardor’s ERC20 equivalent) with the EUR pegged AEUR tokens as well as any other child chain token that will be launched on the Ardor Platform in the future. This is the backbone of a new decentralized interconnected blockchain economy, welcome to the Ardor platform! 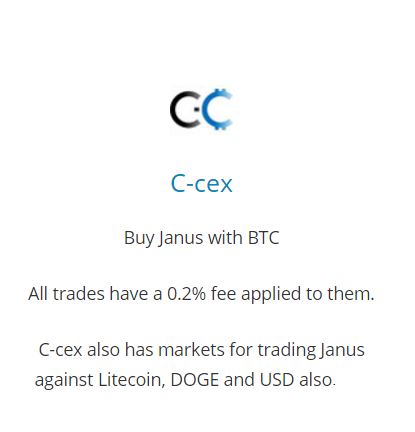 One of the Janus community has submitted/is submitting an application to AEX.com for Janus listing @qiwoman can confirm this, her husband is fluent in Chinese. 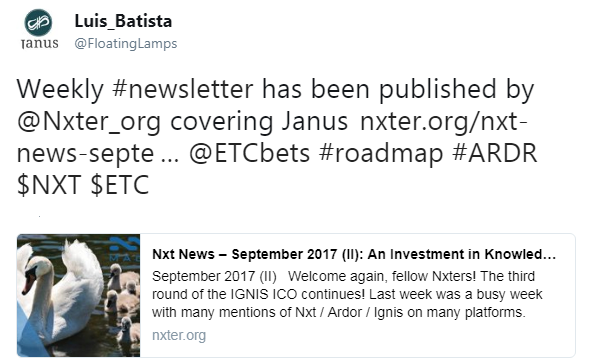 We are hoping since they should have both Ardor and Ignis that it would be an easy add. In the event this actually does occur, it would not be unwise to give them some volume, we have a lot to offer new users, especially this coming year. The volume would definitely help, and C-Cex right now is basically frozen. 4. Begin mining and keep scaling hashpower up, begin JNSHash and scale this up as well. UPDATE- Remodeling of the $JNS token website is complete! 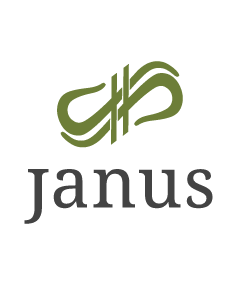 Our goal with this new website is to provide our visitors an easier way to learn about Janus Projects. 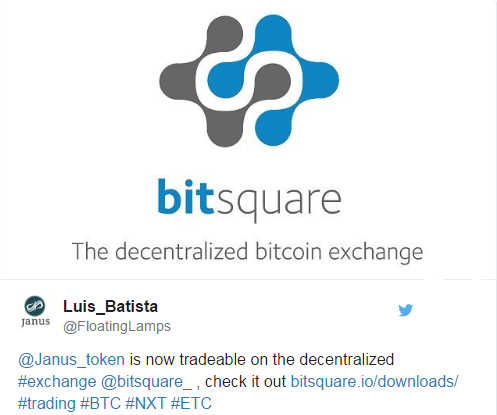 Facebook, Twitter, Slack, Youtube and a new Telegram channel to foster improved communication with the community. We will be constantly updating our content with helpful information about the projects in progress. We hope you find the new website fresh and modern; we worked hard to make sure it contains valuable information to assist you. 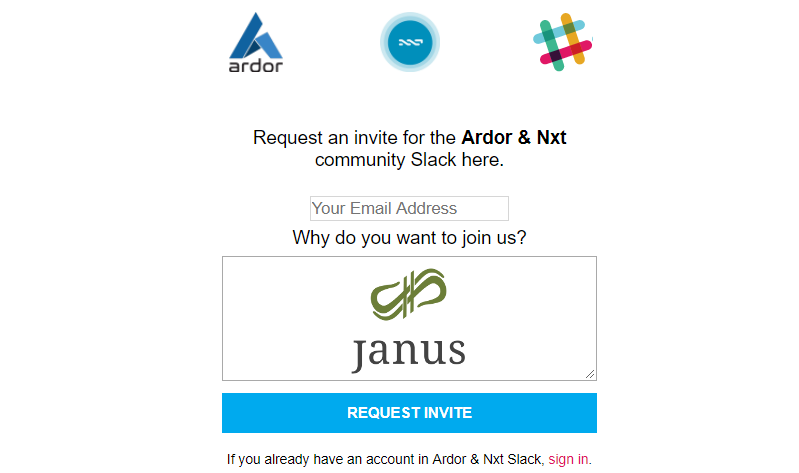 IMPORTANT: Your ARDOR ID/address on the client will act as your JANUS address to receive the token in your private wallet.Similar as ERC20 tokens equivalent. 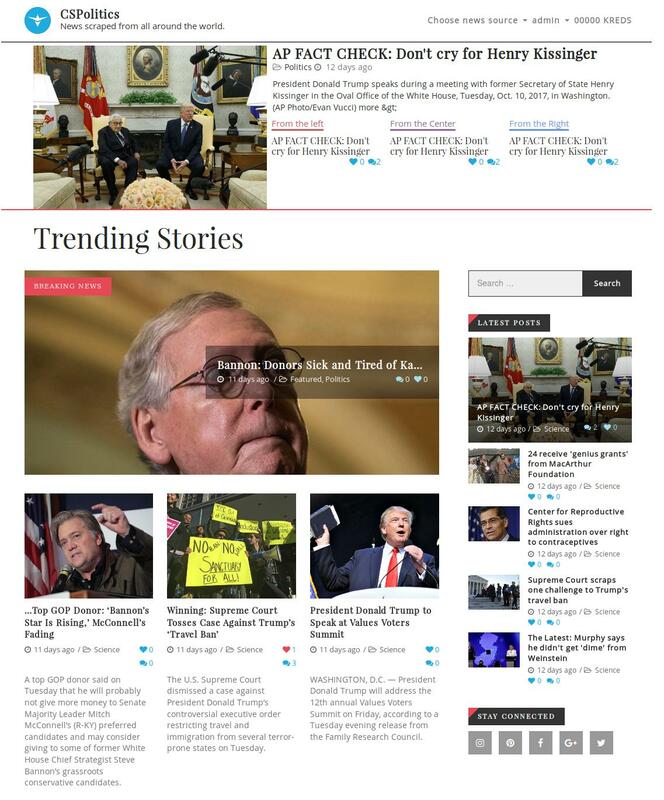 Testing of our media aggregator (scraper) site will begin over the next 10 days. 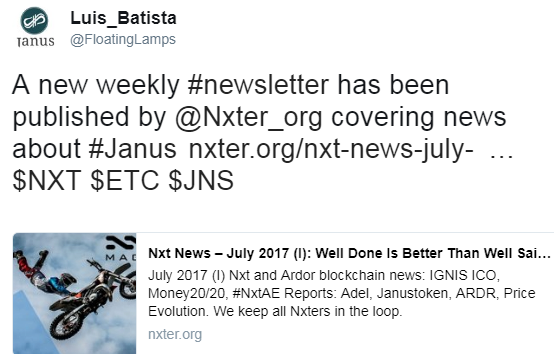 PSA- "Janus balances on C-CEX.com"
As everyone knows, Janus tokens were swapped from NXT blockchain to Ardor blockchain, which constituted an immediate deactivation of the $JNS token on the NXT blockchain. 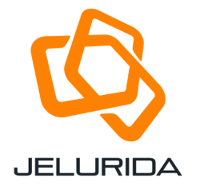 See here the official announcement of Jelurida: https://www.jelurida.com/snapshot-instructions. 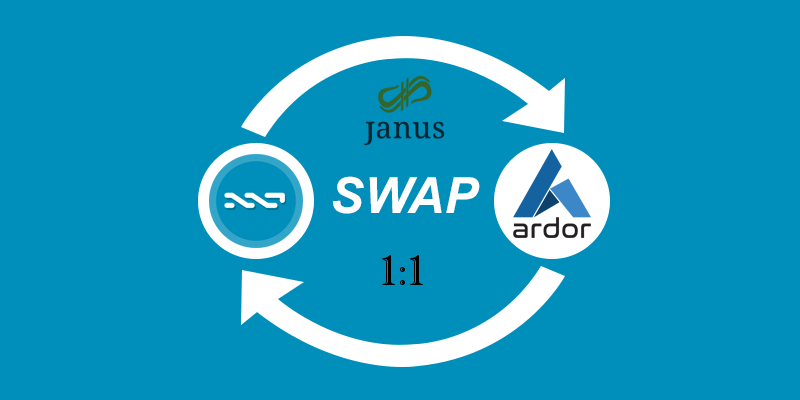 We expected in a normal way that the respective external exchanges such C-CEX.com, upgrade their wallet and at the same time, they would support the new Ardor Platform, where the real Janus tokens are right now. After a long conversation, mainly with the owner of C-CEX.com, they decided not to upgrade to Ardor wallet. 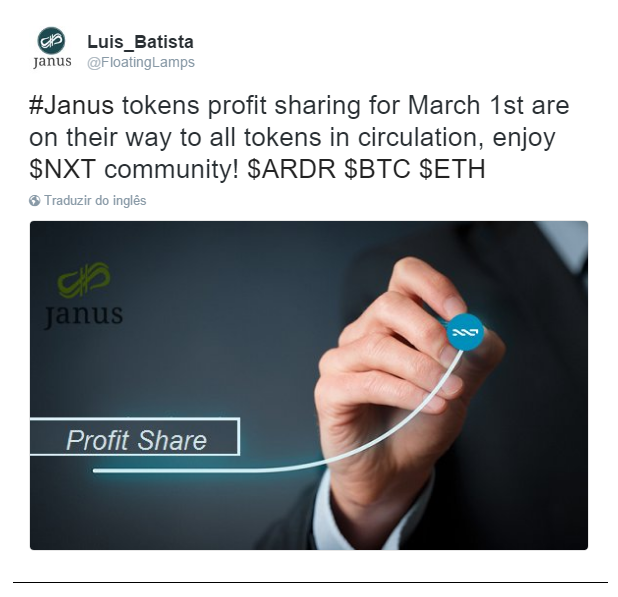 We explained that position affects Janus users since with the current JNS NXT version you can not send/receive/withdraw unless they perform the upgrade. Unfortunately, there does not appear to be a resolution we can reach with C-CEX.com and the way they handled deposits was, not ideal. 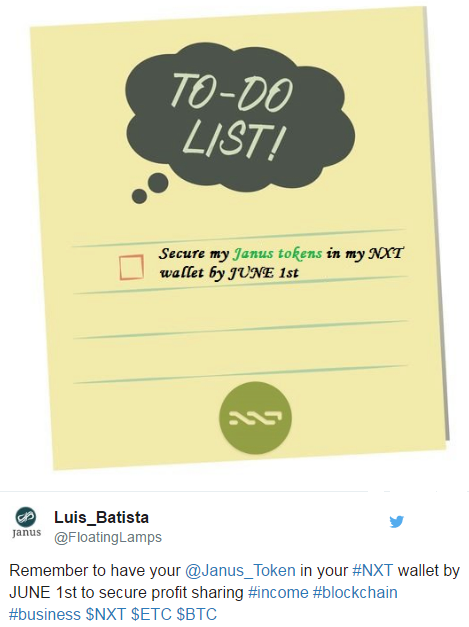 After a meeting with the whole Janus Project core team, we decided that the best solution and move forward would be to OFFER the coverage of all 200k $JNS on C-CEX.com for users. 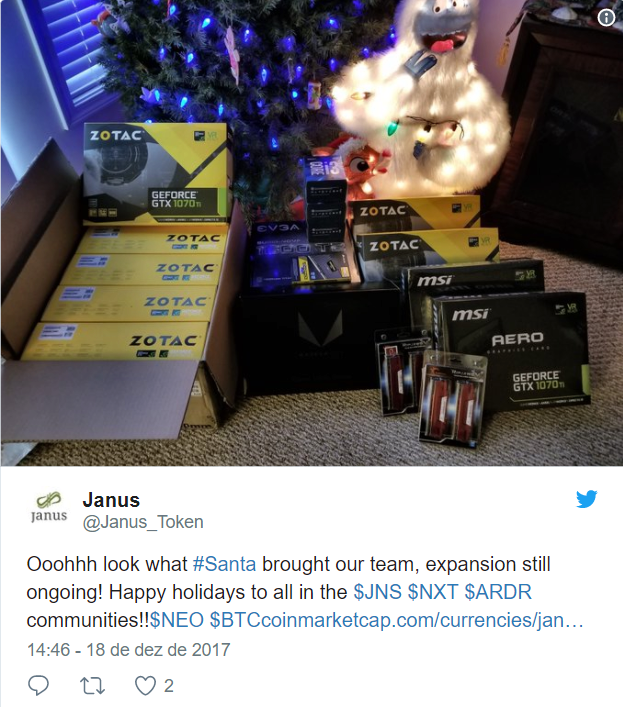 That being said, if you´re one of the users affected or you have a friend who has $JNS tokens on C-CEX.comas well, please email us at bjorn@janustoken.com or private message us on slack https://ardornxt.slack.com ( email is better) and provide as much unaltered info as possible like screenshots and we will hopefully get everyone affected taken care of. We do have ways of checking for altered photos, so please don't ruin this for the next user, let's make it easy and good for all. CashFaucets.com - Get free ERC-20 and Ardor's child chain tokens. 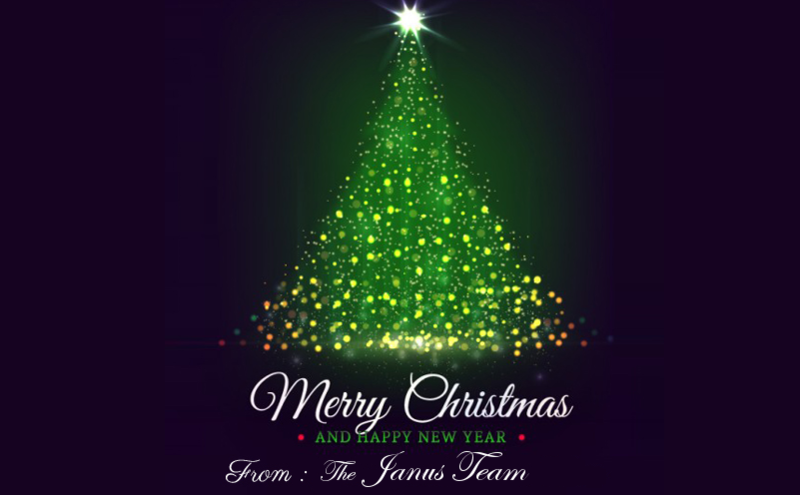 We feel with everything planned for release this year, that it would be extremely unfair to allow a single exchange to remove many of the benefits we have for Janus tokens from our community and users. It is something we morally have to protect when we have the resources, so the decision was based on several factors. Ardor v2.0.13 is released with UI improvements and bugfixes as well as Desktop wallet performance optimizations. This new child chain token, AEUR, is directly pegged to the Euro, and provides a quick and simple way for users to purchase cryptocurrency using a Mistertango account. We are very close to the launch of our new blockchain network called ‘Kreds’ KredsBlockchain.com will be used by our team to create an ecosystem of world utility, action-based reward, and digital currency within several media and news websites. As a way of thanking your support, we are distributing up to 49,500,000 KREDS to Janus token users based on their account balances through snapshot method, at 1 JNS =2 KREDS ratio. The one-time snapshot over the Ardor Blockchain is planned for February 3rd, 2018, at block height 48484. Please plan your trading on Ardor for Janus tokens accordingly. 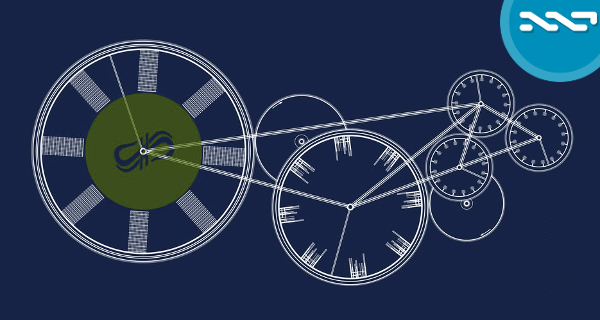 KREDS coins will be allocated to user accounts over the course of 90 days following the Kreds blockchain genesis block, which will happen within the next 30 days. 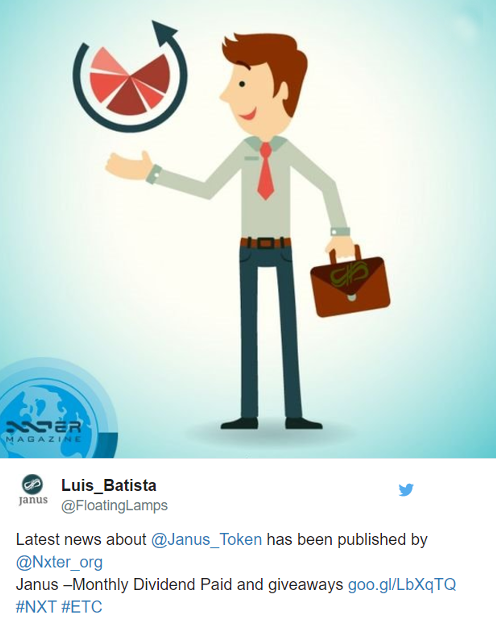 Note: There will only be a 90-day claim window for the airdrop Janus users. After that period, all the unclaimed coins will revert to our team for marketing allotment. where are my 10% free coins ? The building owner has stated they must perform some of this due to city code, so this is the reason for the delay. However, this is an opportunity (because I am also trying to look on the bright side here). This means we can see if the new Nvidia line of GPU comes out which is super important for future investment into the hashrate, and also the release of new asic machines. 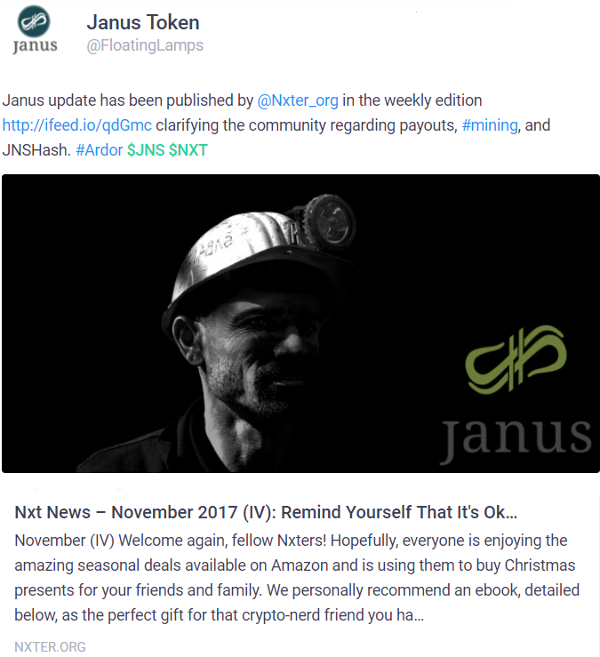 Thank you all for helping spread word of both JNS and KREDS, it will be quite a year but like any world currency, it takes a community to build and give it the usage it needs. Details regarding the airdrop for JNS users will be available within 2 weeks, depending on administration times within our team it could be sooner. Users anticipating coins please be patient as we will process this securely and using cryptographic messages on Ardor platform to verify the validity of claimed Kreds. 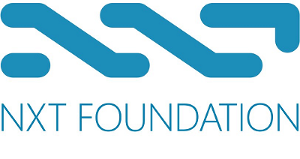 Please note: this was not a hyped airdrop and intended for the JNS community by design, the snapshot has already passed, and is the only portion of Kreds designated through this distribution method. 90 day claim window for the users in JNS who participated, all coins not claimed will be returned to the websites' funds for disbursement. 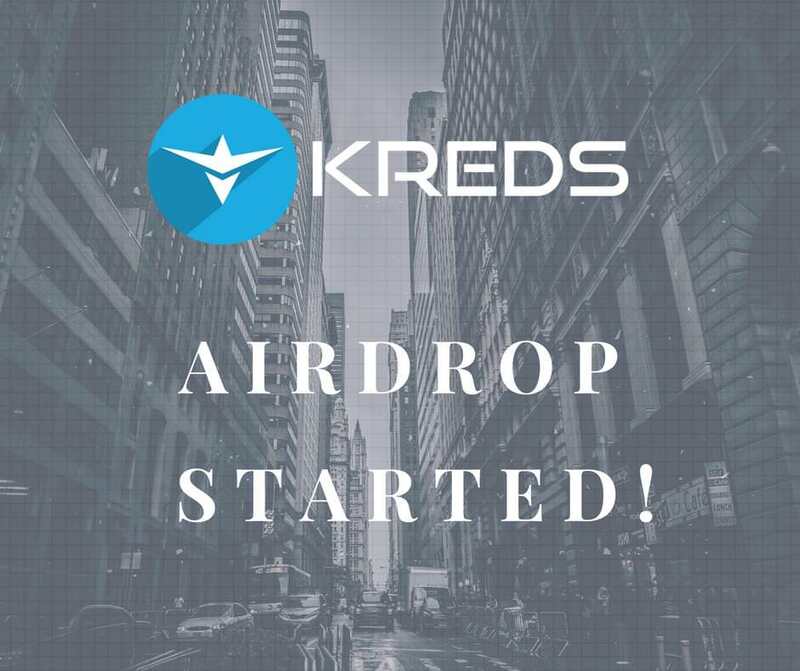 This will be an early user distribution phase to spread Kreds further before we bring mainstream into the Kreds' ecosystem through the first of several integrated sites. Please note, because of the volatility of the US political environment it DOES serve as a good attention starting platform for Kreds use and adoption. So if you are not a fan of politics, that is OK, it is business and this is all. There will be several other pop culture and genre-based websites that we are building and launching this year for Kreds. The goal we set as a team is one news aggregator every 2 months fully integrated with Kreds user-driven action model. 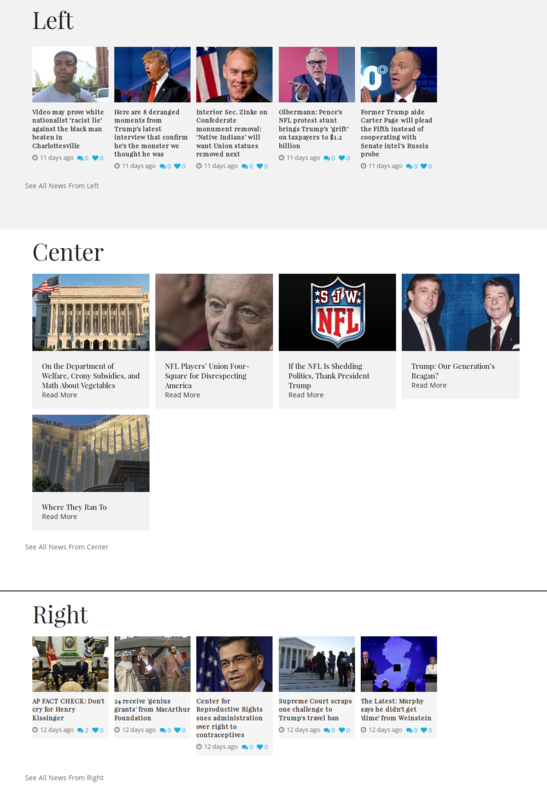 When we release Kreds strategic vision document (aka: whitepaper) it will include the genre and scope for this year and further websites. 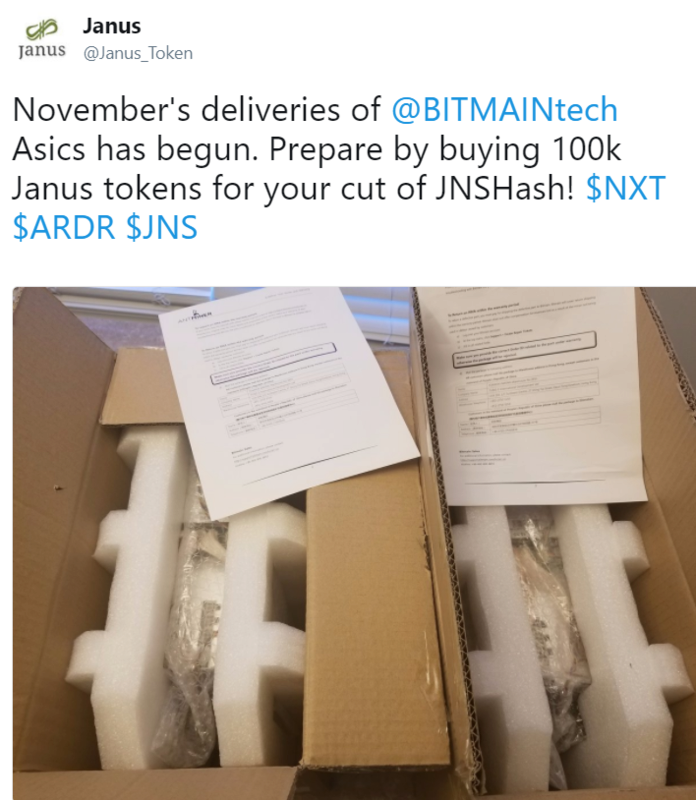 "How to claim your $KREDS balance if you’re a #Janus holder." Note: Do not clog the support email by asking for the coins. The amount of scamming for our generosity to give CCEX users who lost coins from their refusal to upgrade to Ardor has reached a peak. We are no longer offering this after paying out over 160,000 JNS our team has done our best and what we felt was a gesture of good faith is now being misused. As of this post any email regarding CCEX claims will be deleted. We hope those who were genuine are happy our team could prevent a total loss that was out of our control. 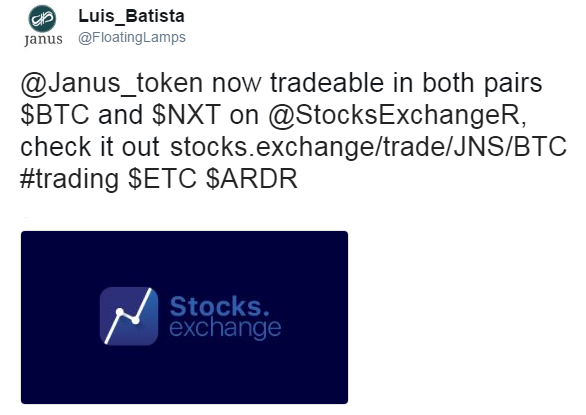 JanusToken ($JNS) is now reopened for trading on @StocksExchangeR.